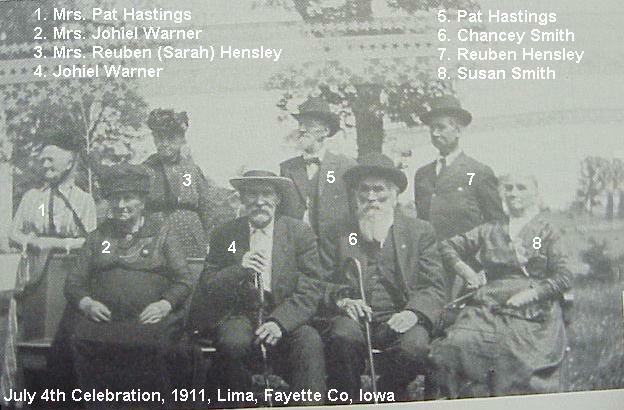 Hensley family of Lima, Albany, Fayette Westfield Township, Fayette County, Iowa. Plus early pioneer history of Fayette County, Iowa. Andrew's son A.J. about 1875. Studying and understanding one pioneer families pioneer life and movement into Fayette County can model other early 'first' settlers. Many of these people also had family and/or 'neighbor' connections as they moved westward across the country into 'new territory' as the Indians were 'exterminated' from the land. with the old bridge are the only remaining structures from Lima, Albany, Frog Hollow. The pioneer farms and villages are gone, faded from all but a very few memories. 1822, age 19, came to eastern Illinois from Kentucky with father's family. Removed from (Floyd Co?) Kentucky to Edgar Co, Illinois, mid-eastern border area with his father William James Hensley and family. The Edgar and Coles county area at the time was a total frontier, thus Andrew spent almost his entire life as a frontier pioneer. 1824, age 21, Married Susan Lewis (1806 Virginia-1837 Illinois) in Edgar Co, Illinois. 1837, age 34,First wife Susan Lewis dies in Edgar Co, Illinois area. 1838, Married Sarah Lovell (1819 Indiana-1872 Lima) in Edgar Co, Illinois. 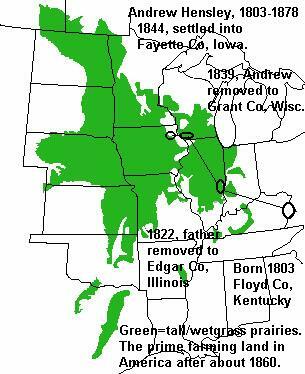 1839, Andrew was farming/gathering in Edgar Co, Illinois from 1822-1839, from age 19 to 26+. He apparently was moving across Illinois into Missouri plus 'exploring' land possibilities in the north along the Illinois and Wisconsin border. 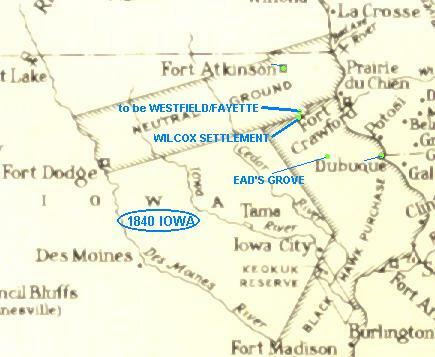 1840, The Wilcox settlement starts along the Mission Trail in Fayette Co, Iowa. Andrew Hensley will shortly arrive to work and live with all of the first pioneers into the area. 1842, age 39, came to Fayette County for land. Andrew would arrive in the area around the Wilcox settlement and buy the claim of Nathaniel Wilcox, four miles to the east in Bear Grove, Sec. 1, Smithfield Twp, Fayette County, Iowa, then returned to Grant Co, Wisconsin for the family. 1842/43, Became sick and remained in Grant Co, Wisconsin. 1843/44, Brought the family as far as Ead's Grove (Manchester, Iowa) and over-wintered. NOTE: There is some conflict of thought, mine, as to where the family was staying upon the move into to Fayette Co in the spring of 1844 after over-wintering at Ead's Grove. 1844, Bought the claim and moved into the primitive cabin of Madison Brown, Sec 36, Westfield Twp, at the head of Grannis Creek. 1844, Mrs. Hensley had a run-in at the 'Brown' cabin with three Indian braves, became concerned and would not return. 1844, Andrew moves the family into the old Franklin Wilcox cabin at Wilcox settlement 4+ miles to the west. 1845, Age 42, Living and farming in Fayette County begins in earnest on the Bear and Grannis Creek areas. Andrew made a quantity of maple sugar, probably in Grannis Canyon. 1845, Andrew harvest the first crop of wheat grown in Fayette County. His young boys, A.J. and Jacob would take a wagon load pulled by 3-4 yoke of oxen, 75 miles to the south to the mill at Cascade, in Delaware County. 1845, Andrew constructed his own log cabin on the first claim he purchased in 1842 from Nathaniel Wilcox on the north side of Bear Creek in Bear Grove in the Corn Hills area, and only a mile+ south of the 'Brown' cabin and claim. Andrew apparently farmed this two claims near Grannis and Bear Creek in the later half of the 1840's. He would have been doing a variety of activities to 'make a living,' to include clearing timber, farming small fields, raising a few livestock, collecting honey, hauling floor and other items to Fort Atkinson, etc. Andrew would also have been 'probing' and 'exploring' for new land possibilities across the neutral grounds line immediately to the north of his 'claims' in the Volga River flowage. The Volga river bottoms and hills were very prime land locations for anyone with Andrew's knowledge of farming, subsistent agriculture and apparently milling. 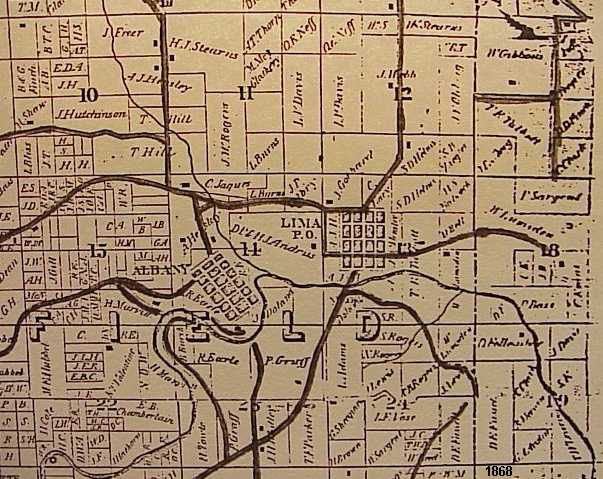 It would be to the Volga river bottoms at Lightville (Lima) that Andrew Hensley would take up a nice parcel of farm, built a mill and become a very significant part of the successful development of the pioneer villages of Lima and Albany and the Frog Hollow valley. He would live the rest of his life in the Lima, Albany area as would some of his descendants. 1845/46, Andrew Hensley, Madison Brown, Horace Bemis, James Beatty, Lorenzo Mulliken and Mr. Messenger hauled floor from the mill at Quasqueton to the Fort a journey about about 70 miles by snow sleds pulled by multiple yoke of oxen. Young A.J., about 13 years old was actively involved, working with the men. 1846/47, The Hensley children attended school at Ead's Grove (Manchester) 40 miles to the SW along the Mission Trail. 1847, Andrew was elected as one of three justice of the peace in Fayette County, which was attached to Hewitt Twp, of Clayton Co.
1848, Andrew Hensley, J.P., married Glidden and Lowe. 1848, From 1844-1848, Andrew, his young sons, and his few pioneer neighbors were subsistent farming and gathering, plus 'making wages' hauling commodities along the Mission Trial from Dubuque to the Fort. 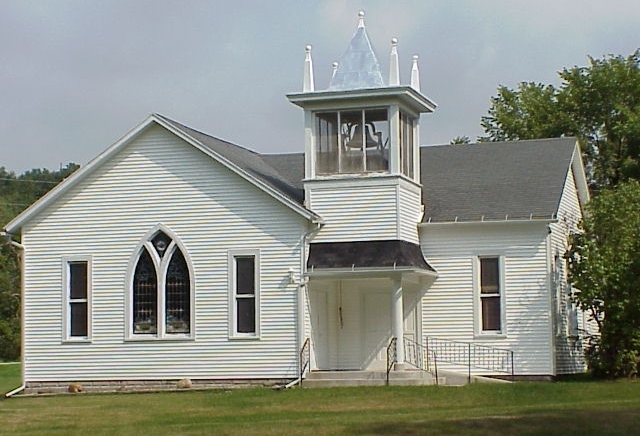 They make numerous journeys to Fort Atkinson and the Mission. There were long, slow trips by multiple yoke of oxen pulling freight wagons and in winter heavy snow sleds. Starting in about 1850, the family would move into the Volga River valley of today's Lima, Albany and become very successful farmers and millers. Their life would start to rapidly change from log cabin dwelling subsistence frontier pioneers to stationary quite affluent farmers and millers during the next two decades. 1849, age 46, moved into the Volga valley where he would farm and live the remainder of his live. Andrew Hensley, October 19, 1849, entered section 19, in Illyria Twp, Fayette Co, Iowa. This is the along the Volga River just to the east of the "to be" village of Lima, and on the line between Westfield and Illyria Twp. This is one of the early entries of land in Fayette County above the neutral ground line. Andrew would soon take over the mill site at Lightville (Lima) about a mile upriver from this 1849 land entry. 1850, Up to this time Andrew used Dubuque 70+ miles away, as his post office and for necessary commodities and supplies. 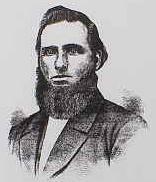 1850, As Fayette County government is formed with local control, Andrew was elected at a meeting October 8, as one of the three judges for Westfield Twp. 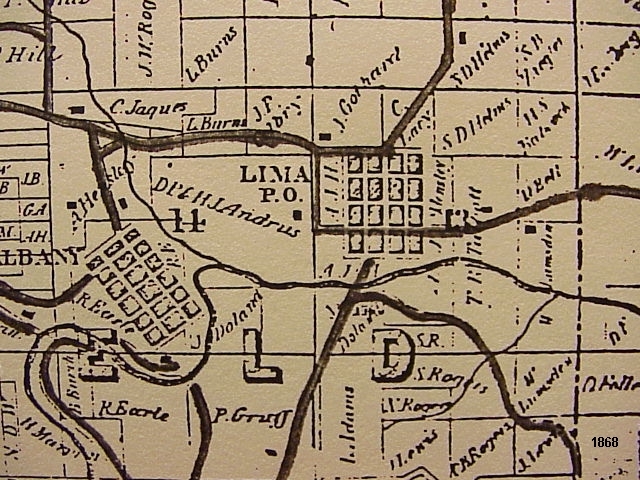 1851, Andrew acquired the Lima mill site and most of the land immediately around the mill and Lima. He would move the family upriver about one mile to Lima, from his 'entry' land in sec 19, Illyria Twp. 1852, age 49, Puts the Lima mill into operation. The Hensley mill at Lima, a first generation saw and grist mill became operational. 1855, age 52, Buys and enters the farm just north of Albany to live out his life. Andrew sold the mill at Lima with the surrounding land to Mr. Durfey. 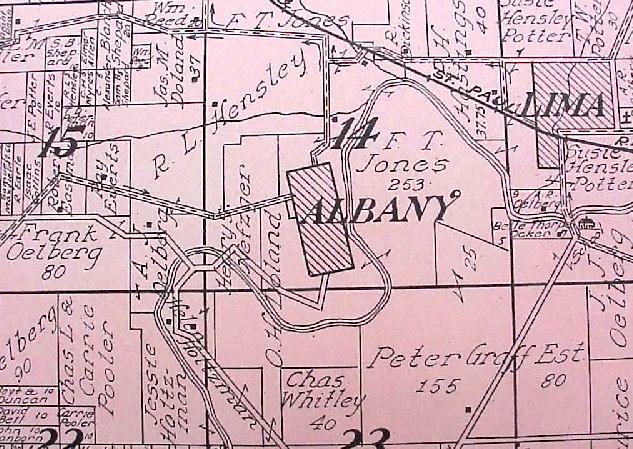 The Hensley's would get the mill and much of the farm land completely around Lima back in their ownership about 1865. Andrew would stay at his Albany farm until his death in 1878. At this time the mill property apparently returned into the hands of the Hensley family from the Durfey family who would continue to run the mill. A.J., Andrew's son was about 22+ when his father moved to the Albany farm. A.J. 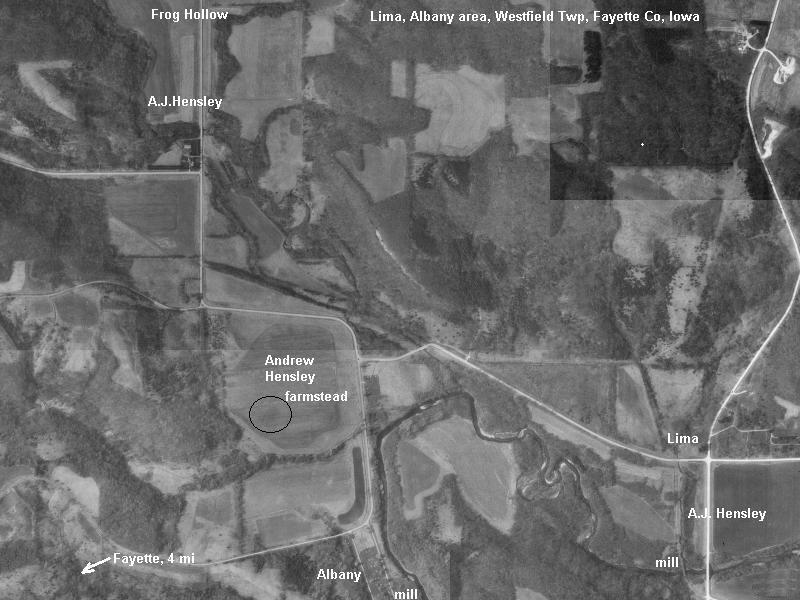 retained the land around Lima when his father moved to the Albany farm, plus operated a farm a mile farther north up Frog Hollow of his father. After re-acquiring the mill site, A. J. would control the mill and continue farm the fields adjacent and nearly completely around Lima. 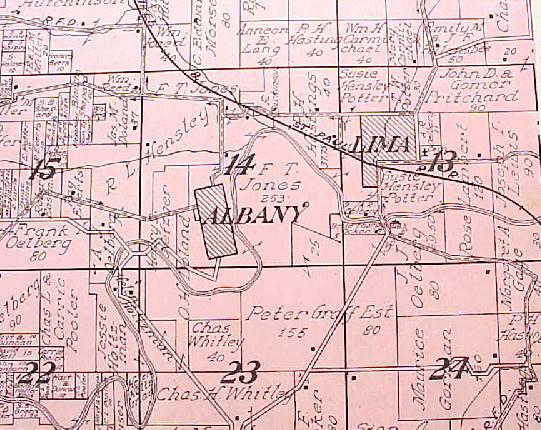 The Hensley offspring would marry into local families, to include the Jones, Potter, Perkins, Smith surnames, thus through time on the plat maps around Albany and Lima one will see farm area continue to be owned by the 'clans.' The Hensley offspring would also marry into Brush Creek (Arlington), Taylorsville (now gone) and Fayette families. 1856, age 53. Son James Hensley born (1856 Albany farm - ? ), his second wife, Sarah Lovell (1819 Indiana-1872 Lima) is age 37 at the time. 1878, age 75, Andrew Hensley patriarch of the Fayette County Hensley clan dies at the Albany farm. and on into the 1900's, Patriarch of the Hensley family at Lima, Albany, Frog Hollow, Andrew dies. His farm would be in the hands of his Perkins in-laws, with son Reuben L. taking over the farm and acquiring nearly all of the bottom and and into the western hill side, farming the area in the early 1900's until his death. A.J. remained on the Lima farm with his daughter Susie Hensley Potter taking over that land prior to A.J. 's death in 1925. 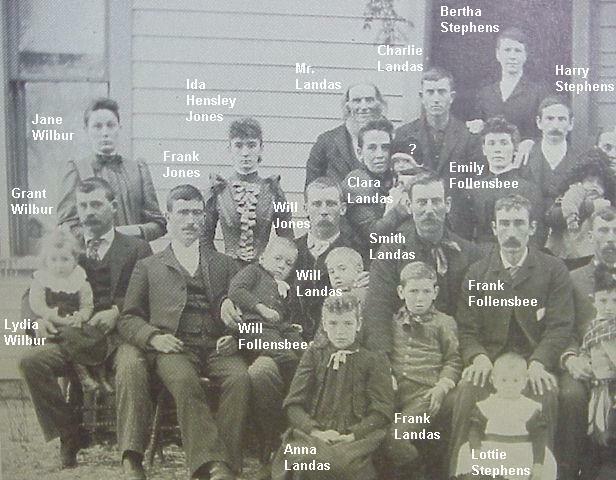 The Hensley clan would marry into several of the local Lima, Albany surnames of the Volga River and Frog Hollow valleys. The area was never highly populated, with both villages remaining small in support of the a limited number of local farmers, with a store or two, some craftsmen, mills, country schools, a few local churches, a couple of local doctors, etc. 1900's, The Hensley surname, like most of the surnames of Westfield township becomes less obvious with the increasing population and its mobility to the larger cities due to rail and auto transportation. Lima and Albany remained a small farming area and disappeared into memory as the big business of the 1960's and beyond drastically change agriculture and culture. The area never ended in the mega farms of the row crop prairies to the west of Fayette, but the farms did become bigger with few and few families in the area. The conservation commission starting the 1960's acquired nearly all the land from Lima village to the west through Albany and Frog Hollow, plus all the way upriver to near Fayette. Today the Hensley genes are gone from the exact land they pioneered, but do remain the area with a few related clan surnames. Actually most of the area surnames are now gone, only memories, as are Lima, Albany, Frog Hollow. NOTE: Please suspect all of the information on this page. It is an assembly of sketchy historical information blended with internet material, plus personal interest material from having grown up in the same area of the Andrew Hensley clan, Westfield Township, Fayette County, Iowa. I rarely revisit a page after the initial upload but will make additions when new ideas are processed and/or errors found so feel free to send info/edits/genealogy to add to the page. I would like Hensley or related surname information and pictures, as well as Lima, Albany, Frog Hollow material to add to the site. Andrew Jackson (1833-1925, Jack or A.J.) Hensley, portrait above) was about ten years old when his father Andrew Hensley (1803-1878) brought the family into Fayette County, Iowa. The family was one of the very first pioneer settlers of the county and would stay in the Volga River Valley area from Fayette to Albany and Lima. Andrew was active in early county and community affairs, being influential farmers and millers in the Lima, Albany, Frog Hollow area as a very viable farming 'community' developed. Andrew Hensley's history is closely intertwined with the early history of Westfield Township, Fayette County, Iowa, some of which is summarized below. Andrew Hensley and his family were working with and interacting with nearly all the 'first' families into Fayette County pioneering just below the "Neutral Grounds" along the Mission Trail from about 1840, until the Indians were moved completely out and the 'white tide' took over the land of the Volga River Valley. Especially during the 1850's thousands of men tramped over Fayette county looking for land that pleased them for which they could go to the government land office at Dubuque and make "original entry" and get the certificate entitling them to a "land patent." For these "entries" they paid cash or turned over land warrants. The patents of record at West Union for most lands show whether cash was paid or land warrant turned in to the government. If a land warrant was used the patent shows the name of the soldier and the military service for which it was issued. 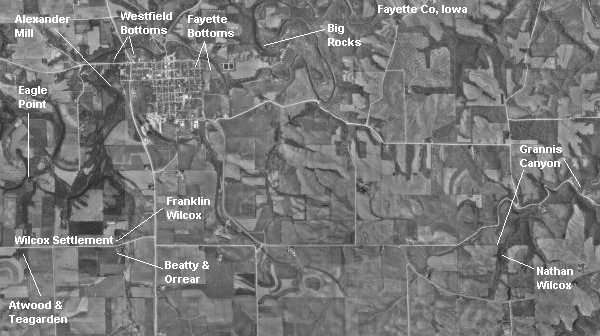 Excerpts from the 1878 History of Fayette County Iowa with edits by bz to interpret the Hensley beginnings in Fayette County. "The first white settlements in Fayette County were made south of, and near the Neutral or Winnebago Reserve Line, in that part of the county that was included in the Black Hawk Purchase, and there is no knowledge or tradition of any such settlement prior to 1840, except the attempt of Edson & Grant to build a mill on Otter Creek, although it is very probable that trappers and Indian traders may have built temporary cabins in this region prior to that time. These roving frontiersmen were accustomed to start out in the Fall, taking some flour and salt, build temporary cabins near some good spring or stream, sheltered by timber, and spend the Winter in hunting and trapping, and sometimes, "made wages. In 1840, the Government established a military post north of Fayette County, in Winnesheik, called Fort Atkinson, and three or four miles south established a Mission school for the Winnebagoes. This naturally attracted the attention of the pioneers of that day, and in the Spring or early Summer of 1840, Franklin WILCOX, with his wife and little daughter, and his brother Nathaniel, came from Illinois to Fayette County and made a settlement. Franklin Wilcox built a cabin thirty or forty rods north of the north line of Township 92-8, on unsurveyed land, six or eight rods west of a little creek that runs northerly through the southeast quarter of Section 32. The bed of the creek has changed since that time. Its channel was then east of the east end of the iron bridge that now spans the stream at that point. The site of this pioneer cabin as pointed out to the historian, on the 16th day of June, 1878, by Mr. LAMB, was about five rods northwest of the northwest corner of the west stone pier of the bridge, near some thorn apple trees. There appears to have been an excavation, and some of the stones of an old chimney are still to be seen. It is said that Wilcox did some breaking (plowing) either east of the creek or on the little sheltered prairie north of his cabin. If this is true, this was the first breaking done in Fayette County. Nathaniel Wilcox (Franklin's younger brother)made a claim east of his brother's place, on Section 1, Township 92, Range 8 (This was along Bear Creek in Section 1 of Smithfield Township.) in what would be called Bear Grove). Elias Dudley Wilcox moved to Vermont from New Hampshire with his brother. Elias and Polly Chittenden were married in Orwell, Vermont in either 1811 or 1812. ….Elias and Polly had at least three children. ….It's not clear when Polly died, but it was probably prior to 1835 as she isn't mentioned as being in Iowa in 1840. ….At some point, Elias and/or his children moved from Vermont to New York, to Illinois to Indiana, and then on to Iowa, together or separately. ….Franklin Sylvester Wilcox (called Frederick in one report) was apparently the oldest son, born Nov. 6, 1815 in Vermont. He married Harriet Van Dorn Mar 19 1834 in Syracuse, Onondage Co., NY. Harriet was born in Syracuse in 1814. ….Their daughter, Mary Susan, was born June 1, 1835 in Onondage Co., NY. ...Nathaniel Wilcox was born between 1816 and 1819. ….Mary Angelina Wilcox was born about 1820. She married Thomas Isreal in 1836 in Illinois and had her daughter, Ellen Louise, was born in 1838 in Canton, Fulton Co., Illinois. They appear to have divorced in September, 1939 in Illinois. Mary Wilcox would marry William O'Rear at Wilcox settlement in Fayette County. ….According to the "History of Fayette County, Iowa," Elias, Franklin and his wife and small daughter, and brother Nathaniel came from Eads' Grove, Delaware Co., Iowa to Fayette County and were some of the first settlers in the area after Fort Atkinson was established. ….Elias , the father, was a blacksmith and settled between the Mission and Fort Atkinson. Franklin built a cabin 30-40 rods north of the north line of Township 92-8. Nathaniel made a claim east of his brother's place. Mary Wilcox is also mentioned. The Wilcox's came with a man named Robert Gamble, who returned to Eads' Grove shortly after. Elias apparently went to Oregon around 1848 with his son Nathaniel. See Bancroft's "History of Oregon," Vol. I, page 752. ...There was a 'tradition' that some Wilcox built a cabin south of the Volga about 1835, ten years after the Black Hawk purchase. This would place the family in Fayette County between 1835-1840. However, another source remembers the family in Eads' Grove in 1840 when the family moved up on the Volga. This is reinforced by the fact that Mary Angelina Wilcox Isreal (O'Rear) had her daughter Ellen Louise Isreal in November, 1838 or 1840 in Canton, Fulton Co., Illinois, and Harriet had her daughter in New York in June, 1835. It is not known if they traveled together or separately and reunited in Fayette County. Franklin Wilcox died in Nevada City, California in 1851. Harriet Van Dorn, Franklin's wife, died in San Francisco in 1871. Mary & William O'Rear eventually moved to Missouri, probably before 1850 but they are not in the 1850 census in either Fayette County, Iowa or Nodaway County, Missouri. They had two children, Elias Dudley and Laura who may have been born in Iowa. Mary and William may have died in Maryville, Nodaway Co., in the early 1900s. ABOVE: 1875 map; 1990's aerial below. Andrew Hensley would start out on the Nathan Wilcox claim, but when the Indians were completely forced from the land and the area above the Mission Trail opened to the whites, Andrew Hensley would acquire farm and mill land about 1850 around 'Lightville' (Lima) and live his life farming and milling in the Lima, Albany, Frog Hollow valley of the Volga River, three miles immediately north of his first small fields in Bear Grove. ABOVE: Many of the first settlers into Fayette County would utilize the Wilcox double cabin and 'settlement' before establishing their own claim to land. Franklin Wilcox would move to near the Fort in Winneshiek County about 1842, leaving the cabin to others to own and use, as was the case with his brother Nathan's claim in Bear Grove, which he would 'sell' to Andrew Hensley. Joseph HEWETT, an Indian trader, who was well known to the early settlers, and somewhat connected with the history of Fayette county, established his trading post northwest of Strawberry Point, very near the east line of Fayette, in Clayton County, in 1840. He visited the region in 1839, and when the mission was established he thought the place he selected would be a good place for a trading post. All of the early settlers interacted with each other along the Mission Trail and this was a time of little to no county structure. George CULVER built a double log cabin on the north bank of the Volga, on Section 26 (about a mile east of Wadena), Twp 93 (Illyria), Range 7. Previous to 1839 he had been the Teller of the Ypsilanti Bank, Michigan. When Mr. HEWETT established a trading post near the Fayette CO line in 1840, Mr. Culver became his partner and moved thither. . . Mr. Culver entered, by land warrant, Sections 26 and 27, Twp 93, Range 7, January 25, 1849, very soon after the township was surveyed. Samuel Baldwin Olmstead was involved with the Culver trading post and was the administrator for Fort Atkinson in the late 1830's into the 1840s. The Hewitt-Olmstead trading post was run by David Olmsted. However, Samuel Baldwin Olmsted was the "administrator" of this post, and David's brother. The name was spelled variously Olmsted and Olmstead. 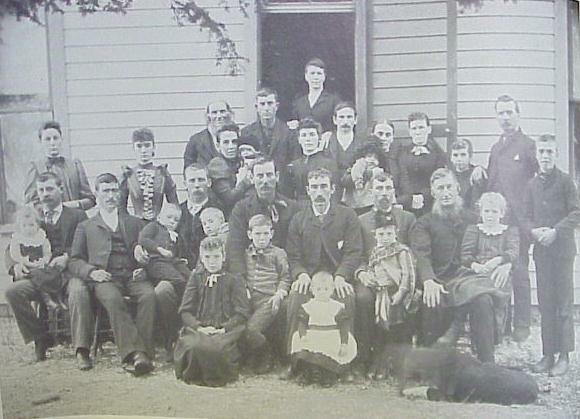 Their father was Timothy Olmsted "descended from some of the earliest Puritan colonists of Connecticut"
Robert GAMBLE came with the Wilcox's from Eads Grove. 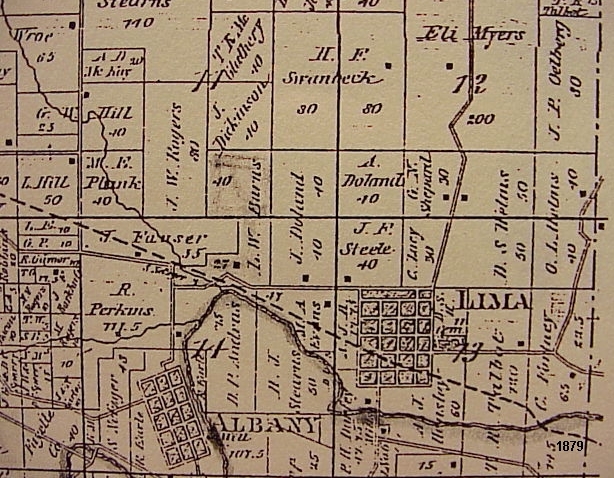 It is said that Gamble selected a location on the Reserve near a large spring, which afterward proved to be on Section 13, Township 93, Range 9, and the grove now known as "DUNHAM'S," north of the spring, was, in consequence, called "Gamble's Grove," and was known by that name in 1850, when the post office of "Gamble's Grove" was established, with Thomas WOODLE for Postmaster. Gamble's Grove was about four miles north northwest of Wilcox's cabin. Mr. Gamble did not remain long, however, as he was taken sick, was carried back to Eads' Grove in the Fall of 1840, and never returned to Fayette County. There is a tradition that Wilcox built a cabin south of the Volga, about 1835, ten years after the Black Hawk Purchase, and spent some time here at that period hunting and trapping. This is purely tradition, however, as there is nothing to corroborate it. It is possible that he may have been here to "spy out the land" prior to removing his family hither in 1840, but this is more than doubtful. Mrs. Joel BAILEY, the daughter of Judge Clement COFFIN, of Coffin's Grove, Delaware, states that she was at Eads' Grove in 1840, when Wilcox and his family moved up on the Volga, and that he had not built a cabin there previous to that time. It is possible that the Wilcox cabin might have been a little further north of the spot indicated, but it could not have been very far. About two hundred yards below (downstream on the creek or actually north toward the Volga River, bz) Wilcox's is a smooth bit of level ground, shaded by trees, which was in "ye olden time" a favorite camping ground for immigrants, and was, in consequence, dubbed "Uncle Sam's Tavern," or "The Continental House." As seen June 4, 1878, the terrific storm of the preceding Saturday night, June 1, must have flooded the site of "Uncle Sam's Tavern" eight or ten feet, and the water crept to within a few feet of the spot where, without doubt, Wilcox dwelt, the pioneer settler of Fayette County, thirty-eight years ago. Next, and soon after Wilcox, probably the next year, two young men, James BEATTY and William ORREAR, or O'REAR, located and built a log cabin a few rods west of the creek, on the northwest quarter of northeast quarter of Section 5, Township 92, Range 8. Their cabin was located near a beautiful spring of clear water that still bubbles from the base of the hill. Mr. HENSLEY (A.J.) states that it was about forty rods south or southwest of Wilcox's place, just south of the old Mission Road, which at this point crossed the creek very nearly on the line between Townships 92 and 93, Range 8. (A.J. being ten when he arrived in Fayette County was privilege to know and remember all of the first settlers and travelers along the Mission Trail to the Fort. He would have been young but working right along with the men building a frontier life, thus he was a storehouse of living history for later times). Judge BAILEY, of Delaware, who spent some days here in January, 1843, says that Wilcox's cabin was a little way below, in the timber. There appears to be some difference as to the orthography of O'Rear's name. In his marriage certificate it is spelled "Orrear," and as this is presumably the way he spelled his name, it is adopted in this history. It is impossible now to fix the precise date of Beatty and Orrear's settlement, but in the Fall of 1842, their cabin was the stopping place for a few travelers on the old Mission road, and they had been there long enough to have made some improvements (small fields and out-buildings), and to have built some fences (split rail and brush). Both were unmarried then, and appear to have been industrious and hardworking farmers. In 1841 or 1842 two Indian traders built a small log cabin for a trading post on the Old Mission Road. One of these was Mr. ATWOOD, and the other Henry or Moses TEGARDEN, or TEGARDNER (probably T. Garden). These two were somehow engaged together in whisky trade with the Indians. Both were murdered by some Winnebagos in March 1843. At least one child of Tegarden's was also murdered at the same time. One version of the story is that two other children of Tegarden's were badly wounded but escaped. Their mother was not at home that night. Two sons were William and Daniel. Mrs. Valzick Tegarden married Zophar PERKINS August 5, 1846 and "Bill" married Perkin's eldest daughter, Absenath, August 6, 1847. In 1841 or 1842, probably the latter, although it might have been earlier, a couple of roving Indian Traders, a Mr. Atwood and a Henry or Moses Tea-garden (Teagardner) built a small log cabin for a trading post, on the Old Mission Road as near the Neutral Line and the northernmost limits of the surveyed lands in Fayette County as an eligible site could be found. The records of the Dubuque Parish indicated a man named Henry T. Garden or T. Garden was on the record and lived in Dubuque County in 1837-1838. This man was an Indian trader, and afterwards removed to Fayette, where he was said to have been murdered by the Indians. The records of Clayton County, of later date, mention the names of the Tegarden or Tegardner family. Whether Henry and Moses were identical or were brothers cannot now be determined. Whether it was Garden or Tegarden is not material, but the latter is most familiar to Fayette people. William Van Dorn, Mrs. Frank Wilcox's brother, came in 1843, and M. C. SPERRY located a claim near Mumford's about that time. A Mr. OATMAN, an elderly man, who had been a hotel keeper at La Harpe, Ill., located on the prairie near the little stream called Brush Creek. He began the construction of what was to be a hotel but decided there was no future for a hotel there and soon left the county. (This unoccupied structure was used by people moving along the Mission Trail in the 1840's as temporary shelter. Andrew's wife would stop here on her way down the Trial after being 'scared' out of their 'Brown' cabin on the 'claim' at the head of Grannis Creek in 1844.) His son, Lorenzo, was killed by the Apaches while on the way to California in 1850. Another son and two daughters escaped. One of the daughters wrote a book about her experiences while a captive. James TAPPER was in Fayette CO in 1843 when he was appointed Supervisor of the road from Lowry's farm to the military road. A Mr. MESSENGER settled about 40 rods east of the Tegarden spring, probably in 1844. John MOYNE located a claim near Bear Grove in 1844 but did not enter land or settle permanently until 1847. Madison BROWN built a rude cabin north of Bear Grove and located there with his family in 1844. In July 1845, D. J. FINNEY settled in Township 92, Range 7. Isaac WEBSTER had a claim on the Volga bottom a short distance east of Beatty's, lived with Beatty, and during the season of 1844, raised a crop of oats on part of the ground now covered by the village of Fayette (this is said to be the first crop raised in Fayette County).During the winter of 1845, Lorenzo MULLIKEN lived with Beatty (at Fayette). In 1842 Andrew HENSLEY came from Wisconsin (Grant County, Prairie du Chien area) to Fayette County, and purchased the claim of Nathaniel WILCOX on or near Sec. 1, T. 92, Range 8, about five miles east of Beatty and Orrear's. Mr. Hensley went back to Wisconsin (Grant County, Priaire du Chien area? ?/bz) , intending to return in the same fall but sickness prevented his return. In September 1843, he returned as far as Eads' Grove, Delaware County, with his family, consisting of a wife and four children, among whom was Andrew Jackson HENSLEY when a lad of ten years. Here he spent the Winter (of 1843-1844). In the spring of 1844, he rented Joe Hewett's place, northwest of Strawberry Point, just in the edge of Clayton County, and moved his family into a little cabin about one and a half miles west of Hewett's, in the edge of Fayette County, owned by Moses, son of Joe Hewitt by his first wife. Here, November 27, 1844, Daniel P. HENSLEY was born, the first white child born in Fayette County, unless Mr. Mumford's baby, born in the brush near Yankee Settlement, is to be credited to Fayette. Major Mumford’s date of settlement in Fayette County has been obscure. His given name is forgotten, but he was known among the pioneers as Major. He was living near Brush Creek in the Fall of 1842, and certainly settled there early in that year, or very possibly in the Fall of 1841. His cabin was in the timber a mile or two north of the present village of Brush Creek, in Twp. 92, R. 7, Fairfield, probably on or near Section 16, or the north side of Section 21. He had a little field on the edge of the prairie south of his house, but was not much of a farmer. Within a year or two upon arrival the pioneer families began to intermarry. William ORREAR and Mary A. WILCOX, both of Fayette County, were married on Feb 25, 1844, which appears to be the first marriage of Fayette settlers. On August 6, 1847, George CULVER and Margaret E. CASTALL were married by Rev. 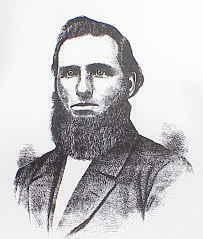 Simeon CLARK, the pioneer preacher of Delaware, and March 27, 1848, Charles GLIDDEN and Mary LOWE were married by Andrew HENSLEY J.P. Mr. (A.J.) Hensley states that William VanDorn and Miss MESSENGER were married in 1845, but the marriage is not recorded. 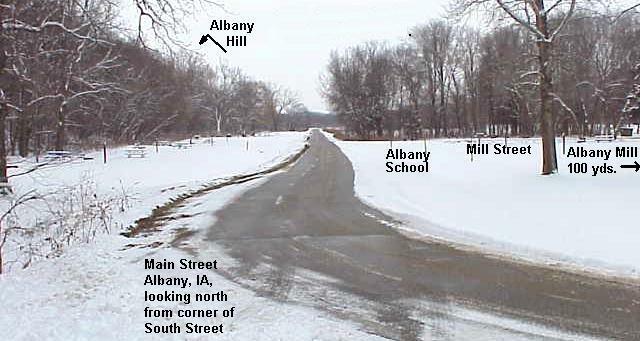 Understanding the location and history of the Mission Road gives light to the movement of pioneer families including Andrew Hensley into Fayette County, Iowa. All of the families were traveling along the trail to sell the Fort commodities and attempt to make a pioneer existence living. They were traveling back to Dubuque and the Mississippi River for mail and manufactured items and also selling some commodities. Travel was generally by heavy draft wagons and winter cargo skids or sleds drawn by multiple hitches of oxen. The Mission Road ran from Dubuque, Iowa, the major Mississippi River river port, northeast across Dubuque, Clayton, Fayette Counties and into Winnesheik County to Fr. Atkinson, a military fort erected under the guise of "protecting" the Winnebago Indians of the area from the Sioux, but in reality would function as a trail to lead supplies and white settlers into the area in the 1840’s. When the United States government first began to service the Neutral Lands, in the late 1830’s, Dubuque was the seat of supervision, and a trail (the Mission Trail) was established between Dubuque and Fort Atkinson. Later, in 1841, an official "Territorial Road" was plotted following the old trail. Because the majority of early settlers in northeastern Iowa came in over this trail, it has significant historical value. Many of the early pioneers would travel the early trails/roads multiple time’s searching/probing for land to claim. Early settlers often were not sure which land was the best, what was available in another place, if they wanted to put forth the significant effort to make a farm go in an area, or if they really wanted to make an area their permanent home. There was a lot of wondering, claiming, and moving in the early years. The early roads and trails often followed the time proven trails of the Native Americans and game trails. The early roads were just worn paths in the timber or through 6-12 ft tall prairie grass, or broad areas of travel where ox-teams were guided along ridges to avoid wet grass prairie, sloughs, stream crossings. Level paths were always at a premium so loads did not have to be split and hauled up the big hills. Generally reach individual settler/teamster had to use his own judgment as to the course of travel. As more travel occurred, the best route became more worn and more travels, thus was the establishment of many of the early roads in Fayette County that would be traveled well into the 1900’s. From the Edgewood area of Clayton County, the trail followed a range of hills to the future town of Strawberry Point, which was built along the old trail, with the long east-west main street being called Mission Street. About three miles west and three miles north of the Point, half way to Brush Creek (Arlington), an Indian trader, Joseph Hewitt, who had a trading post utilized by both Indians and white men in 1840. His trading post was often a resting-place for early settlers whiles they ventured out looking for ground to settle on. The ox-trains hauling supplies and produce to the military post at Fort Atkinson stopped at Hewitt’s on a regular basis. From the Corn Hill area the Mission Road turned to the W and continued to a point a couple of miles SW of present day Fayette. Two miles south of Fayette and about a half mile west, off present day Hwy 150, Franklin Wilcox, in 1840, erected the first permanent log cabin in Fayette County (there is a granite marker on the site today, just to the west of the bridge crossing the little stream, and to the north of the road). It has been written Wilcox broke up a small area close to the cabin and planted it to garden and oats. If so, this would justify as the first land broken in Fayette County. Just north of the Wilcox cabin, around the bend of the creek and below a cove in the hillside was a favorite camping spot known as " Uncle Sam’s Tavern," by the early settlers. The area offered a flat, protected, secluded area with fresh water nearby. At this time the Wilcox cabin was in the south edge of Sec. 32 of Westfield Twp., in un-surveyed land. The four SE townships of Fayette County, Fairfield, Smithfield, Scott and Putnam, had their boundary lines surveyed in 1836 and sup-divisions were made in 1837. The north line of Fairfield and Smithfield was not surveyed until 1848. It is not known if Wilcox knew this or not at the time. 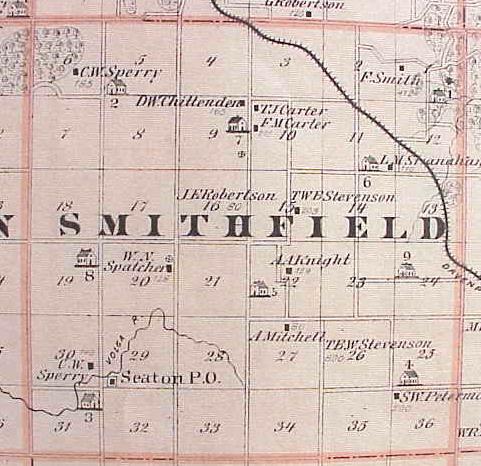 In 1842 or 1843 about a year after the Wilcox cabin went up, a pair of unmarried young men, James Beatty and William Orrear, settled about 600 feet south of the Wilcox cabin and erected a cabin in the north edge of Sec 5 of Smithfield Twp., near a spring. They were reported to be very industrious, and broke land and erected split rail fences. In February of 1844, Orrear married Mary Wilcox, daughter of the elder Franklin Wilcox, who by that time had moved on up the trail to a point near what would be called Dunham’s Grove. This was reported as the first marriage in Fayette County. 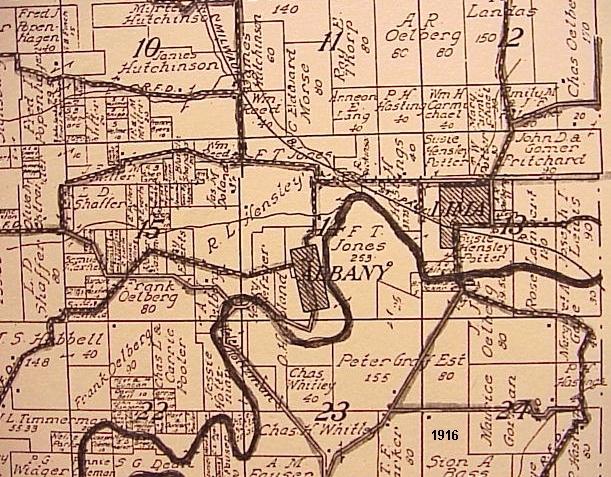 In 1847, the Orrears sold their holdings to Horace Bemis who entered the NW ¼ of Sec 5, of Smithfield Twp., which was the first official entry of land in Fayette County. In the meantime Beatty squatted on land near the western edge of the future town of Westfield/Fayette. The Mission Road beyond the Orrear claim followed a line of low hills about a quarter mile south of the Westfield Twp. Line, to a point near the intersection of Smithfield, Harlan, Center and Westfield Twps., where it turned north. There it crossed the southern boundary of the Neutral Lands just north of the Volga River crossing and on the boundary line of Center and Westfield Townships. Along the Road between Orrears and the township corners were several squatters cabins, including that of Henry Teagarten, who had a trading post for the supply of whisky, black power long guns, power, ball and flint, and other supplies for the Indians and early settlers. Teagarten’s cabin was located about a mile east and a quarter mile south of the four-township corner, near a large spring. This would be the site of the "Teagarten massacre" references elsewhere in the history of Fayette County. The Mission Road continued into the Neutral Land across the eastern edge of Center Twp. Continuing in a NW direction across Windsor Twp., into Windsor Twp., into Auburn Twp., crossing the Little Turkey river and proceeding in a N direction just east of the present day St. Lucas and into Winneshiek Co., Washington Twp., to Ft. Atkinson. A commission as assigned in 1841 to locate a 'first road' in the county. It would follow the randomly wide Mission Trail. An Act to establish a territorial road from the town of Dubuque on the Mississippi River to Fort Atkinson was approved January 31, 1841. (Up to this time an informal route the Mission Trail was used, however the new 'Territorial Road' would follow the Mission Trial route.) Calvert Roberts, Samuel L. Clifton and Joseph Hewitt were appointed to locate the road. The Dubuque County part of the road seem to be the main focus of the Act and since the Act dealt with Fayette County it was repealed in February 16, 1842, and much of the location declared vacated. The repealing act; itself was repealed June 11, 1845. Peter D. Sharp, David Moreland and William J. Anderson were appointed by the Legislature to re-locate the road through Dubuque County, to Colony and Ead’s Grove (Manchester) and then northward into Fayette County and on to Fort Atkinson. 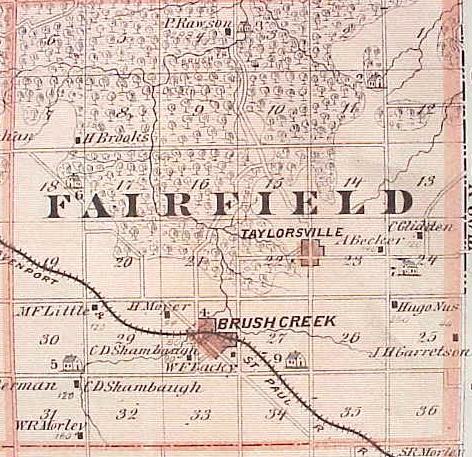 The road as located in 1841, followed very nearly the old trail, entering Fayette County near the SE corner of T92, R7, of Fairfield Twp., passing Joe Hewitt’s Trading Post (near Brush Creek), then to the NW , south of Bear Grove, through Twp 92, R7, and Smithfield, Twp92, R8, passing a little north of the cabin of Beatty and Orrear, near where it intersected the road from Quasqueton and Marion. Then by a circular route, running 15 or 20 rods south of the Teagarden Spring, sweeping the to the north running near the west lane of Sec 31, T93, R8, Westfield, until it passed the quarterpost. Then the road changed its course to the NE crossing the Volga River very near the township line between Smithfield and Westfield, about a quarter of a mile east of the west line of those entering the east side of Sec 36, Twp 93, R9, Center Twp., but running for a short distance in Sec 30, Twp 93, R 8, Westfield, and then continuing in to general northwesterly direction to the north line to Twp 94, R9, Windsor Twp., which it crossed very near the northwest corner of Sec 3, Twp 95, R 9. The following order of the County Commissioners of Clayton County appears of record August 26, 1841: Ordered, That the report of Calvert, Roberts, Samuel S. Clifton and Joseph Hewitt, Commissioners, appointed by the Legislature of Iowa to locate a road from Dubuque to Fort Atkinson, be received, and they be allowed the sum of forty dollars and fifty cents, each, for services in running said road through Fayette and Clayton Counties, and Alfred L. Brown be allowed the sum of forty dollars and fifty cents as surveyor of said road, and also the sum of eight dollars for drafting plat, being extra services. Also. Allen Wilson and Moses Hewitt, chairmen, be allowed the sum of twenty-seven dollars each, and also George Culver, as marker, be allowed the sum of twenty-seven dollars, and Franklin S. Wilcox, as stake driver, be allowed the sum of sixteen dollars, and that Joseph Hewitt be allowed the sum of twenty dollars and twenty-five cents for services of team. Ordered, That two-thirds of the above sum, together with interest until paid, be charged to the county of Fayette. from the 1878 History of Fayette Co, Iowa. During the Summer of 1844, Andrew Hensley employed Daniel B. Noble, of Yankee Settlement, to break some prairie on his claim, north of Bear Grove. During the Winter of 1844-5, he moved his family into the cabin built by Madison Brown (probably in Grannis Canyon), and, in the Spring (of 1845) made a quantity of maple sugar. In the fall of 1845, Mr. (Andrew) Hensley, who had sown winter wheat on the land he had broken the previous Fall, raised a bountiful crop. This was the first wheat known to be grown in Fayette County. In the Autumn, as soon as he could get some of it threshed and dry enough to grind, he sent his two boys, Andrew J. (12 years old) and Jacob G. (9 years old) with twelve bushels loaded on an ox wagon to Cascade in Dubuque County to mill. (Note: Today, 2003, this is 75 miles to the SE of Fayette by modern highway.) It was not an easy task" to go to mill" in those days, and the boys were gone eight days. 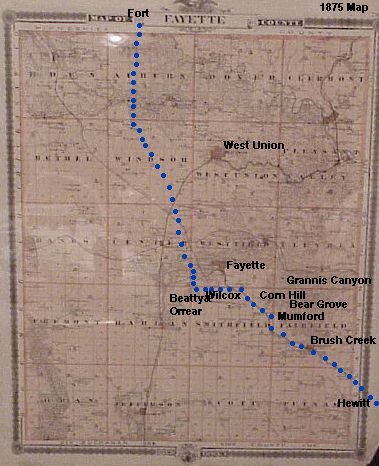 They had reached Hewett's (on the Clayton/Fayette County line) on their way home with the first flour made from Fayette County wheat, but during the night their oxen strayed away and the next morning, not finding their team (several hitches of oxen) they started for home (about ten miles on foot). They were barefooted, and were in constant dread of rattlesnakes as well as Indians. Arriving in sight of home (either just north of Bear Grove or in upper Grannis Canyon) the boys were terrified, that they could discover no signs of life about the premises, and fearing that the rest of the family had been captured and carried away by the Indians. They approached their home very cautious, with heavy hearts but were much relieved and rejoiced when they found their father and mother at the other side of the cabin, digging potatoes. Mr. (Andrew) Hensley went to Hewitt's, found the stray oxen and brought the flour home in safety. The boys dreaded the Indians, and the family appears to have had good cause for hating their un-comfortable and "insolent" neighbors. …In 1845, says A. J. Hensley, William Van Dorn and Miss Messenger were married, although the marriage is not recorded in Clayton County (then the governmental seat for what would be Fayette County) and when Mr. (Andrew) Hensley moved out of the (Franklin) Wilcox cabin, the newly married couple moved into it. (Note: It seems that the Hensley's like many of the first families into Fayette County along the Mission Trail made temporary residence in the double cabin just south of present day Fayette, built by Franklin Wilcox in 1840. In this case Mrs. Hensley would not go back to the 'Brown' cabin (probably at the upper end of Grannis Canyon), where they were living in at the time she had a run-in with three Winnebago Indians in 1844, before building on their own claim at the northwest edge of Bear Grove on Bear Creek. bz/2003) This was probably the first marriage in Fayette, County, if, as is to be presumed, the wedding was at Mr. Messenger's house, and Orrear's wedding was at the elder Wilcox's house at the Mission (Franklin Wilcox had moved up to the Mission area near Ft. Atkinson in Winneshiek County about 1842.). It may be well to add that the double cabin of (Franklin) Wilcox was standing late as 1851. The Bear Grove and Grannis Hollow areas along the Corn Hills. He was along the Mission Trail at the very edge of the hill and prairie country in Fayette County, Iowa. ABOVE: The view is east across sec 1 of Smithfield Twp, Fayette Co, Iowa. In 1842 Andrew Hensley bought the claim of Nathaniel Wilcox. Nathanial had 'marked' a claim to land in about 1840, the same time his older brother Franklin Wilcox has claimed land 4+ miles to one's back when viewing this picture of west. The claim was on the northwest side of Bear Grove near Bear Creek, the remnants which can be seen at the left of this picture. What was to become known as the 'Corn Hills' is the rolling hill line in this picture. The corn hills run from near Arlington to near Fayette and represent the break between the unglaciated area to the left, NE, of the picture and the glaciated prairie to the right, SW, of the picture. The deep prairie roots were extremely difficult to 'break open' or nearly impossible to plow with the early pioneer soft iron or wooden plow boards or shares. ABOVE: To the left of the pictures, a mile+ away is Grannis Creek and a claim of Madison Brown just upstream or west of the big spring in Grannis Canyon (Hollow). Andrew would acquire this claim in 1844 and live at least some of the fall/winter time in the primitive cabin Brown had built. It might be here the Mrs. Hensley had her 'upsetting' encounter with three Indian braves. This same late fall of 1844, Andrew hired Daniel Nobel, apparently from Yankee Settlement (Colesberg in Clayton County) to bring his oxen yokes to this Bear Grove claim and open a small field, which would have been in or near the trees showing in the above picture., where Andrew planted the winter wheat, and would the next spring harvest the first wheat crop in Fayette County. Franklin Wilcox apparently broke a small field area open near his cabin and harvested the first 'crop' in Fayette County, a small oat crop in 1841, just after he built the cabin in 1840. Throughout the 1840's there were very, very few plowed fields in Fayette county. Most were in open stream bottoms, with some in patches cleared of brush and timber. The deep prairies were basically untouchable until the late 1850's. By the early 1860's the prairies W and SW of the Mission Road were rapidly 'broken' by 'sod busters,' men who had learned to make and use very large, heavy single bottom plows pulled by 6-9 yoke of oxen (a yoke is a team or two oxen). PERSONAL NOTE: My Thompson clan at Brush Creek (Arlington) were among the first 'sod busters' in the area, thus they rapidly acquired much of the prime land to the immediately to the west of Arlington, or opened new farms for their relatives and neighbors. Some of the next generation took the 'sod busting' knowledge and ability westward to Nebraska, Kansas, Oklahoma to the short grass prairies, after the Indians were 'run off' the land. ABOVE: The natural vegetation on the Corn Hills was a variety of prairie grasses interspersed with shrugs and trees. About a mile over the ridge to the NE of the trees was the Madison Brown claim that Andrew Hensley would acquire sometime around the spring of 1844. ABOVE: The view is to the SW from the head of Grannis Creek that leads down Grannis Hollow. The same tree line is the same as the second picture above with Bear Grove off to the left, SE, of the picture. His claim and the Madison Brown cabin would have been about a half mile down Grannis Creek, to ones back when viewing the above picture. After the 'Indian scare' in the winter of 1844/45, in the Brown cabin near Grannis Spring, Mrs. Hensley would not return to the cabin. The family apparently spent some of that winter in a rented cabin from Hewitt on the Fayette, Clayton county line, but by the spring of 1845, were living in the Franklin Wilcox cabin. This was a double sided cabin which apparently housed more than one family in transition. By the fall of 1845, Andrew and young sons would have completed there own cabin at the Bear Grove site, probably near or in the tree line below. …During the Summer of 1844, Andrew Hensley employed Daniel B. Noble, of Yankee Settlement, to break (first plowing) some prairie on his claim, north of Bear Grove (in Sec 1, of Smithfield Twp. During the Winter of 1844-45. Andrew moved his family into the cabin built by Madison Brown (probably at the head of Grannis Canyon, just to the north of the 'claimed' land north of Bear Creek that he bought from Nathaniel Wilcox) and, in the Spring of 1845 and made a quantity of maple sugar. ...One day that spring (1845), Mr. Hensley had occasion to go to Hewett's cabin with whom he had some business. His son, Andrew J. (Jackson), or "Jack," as he is familiarly called, accompanied him. They expected to return home the same night, but Mr. Hewett was away, and they waited for him. .
...Mrs. Hensley with the four younger children, were left alone. During the afternoon, three Indians approached the house, and one of them entered. He was insolent, and by signs, not to be misunderstood, endeavored to drive Mrs. Hensley and her children away. She was not to be driven, however, and endeavored to induce the Indian to leave, but he was as stubborn as she. She had informed him that she was expecting her husband every minute, and went out to see if he was coming. She was becoming frightened. …The Indian followed her out, and rudely grasped her by the shoulder. She was a strong, muscular woman, however, and proved more than a match for her tawny assailant. She shook him off and nearly threw him down. In the melee, he struck her a severe blow across the breast with his musket. As soon as she recovered her breath, she went back into the cabin, fastened the door, and watched. There were two loaded muskets in the house and she determined to shoot her insolent foe if he dared to attempt to enter again. He cautiously approached and peered over the door, but, discovering her determined attitude, he did not attempt to enter. …After nightfall Mrs. Hensley, becoming satisfied that her husband and son were not coming home that night and thoroughly alarmed, concluded that the only safety for herself and little ones was in flight. Accordingly. after making a few hasty preparations, she took her baby, Daniel P., about 6 months old and her next youngest child 1+ year, Richard (would die in the Civil War) in her arms, and with the others (two children, Elizabeth 5, and Reuben L. 4) , quietly stole out of the cabin and started for Hewett's cabin ten miles away. …Arriving at "Oatman's" light house" (abandoned cabin on the north edge of Brush Creek, today's Arlington about seven miles away) she left the older children (Elizabeth 5 and Reuben L. 4) there alone, bidding them keep quite until she returned and pushed on through the darkness, arriving late at night at Moses Hewett's, about a mile west of Joe Hewett's trading post (near the Fayette/Clayton County line, another 5 miles). This exciting adventure with her Winnebago neighbors rendered Mrs. Hensley nervous and worried. She refused to go back to the Brown cabin to live and Mr. (Andrew) Hensley moved into the (Franklin) Wilcox cabin, at (Wilcox 'settlement') near Beatty's where his family lived until he built a house on his own Claim, into which he moved early in the Fall 1845 (This would have been the Franklin Wilcox double cabin in sec 31 of Westfield Twp, the 'safe heaven' for a number of settlers moving into the area). It is said that one afternoon, during the following Summer (1846), Mr. (Andrew) Hensley detected an Indian stealthily following him, when he concealed himself behind the upturned roots of a fallen tree and determined to shoot if the native approached nearer than a stump that stood about twenty yards away. The Indian came to the designated point and concluded to go no farther in that direction. Another account states that there was "a deal of dodging about for two or three hours." from the 1878 History of Fayette Co, Iowa, pp 331-332. …In the Winter of 1845-6, the Fayette (county) settlers secured employment in hauling flour from Quasqueton to the Mission. (Note: Quasqueton is about 70 miles SxSE of the Fort. At this time there were only very broad animal/indian trails through the forests and prairie county.) Accordingly, one morning, Andrew Hensley, Madison Brown, Horace Bemis, James Beatty, Lorenzo Mulliken and Mr. Messenger started with their teams (oxen) for Quasqueton. A storm (winter blizzard) arose during the day, which became very severe, as it was accompanied with considerable wind. They missed their way, and instead of making Buffalo Grove, diverged to the left and found themselves in the west end of Coffin's Grove (in Delaware Co.) about nightfall. They tried to go forward the next morning, but the storm " continued and they were forced, to return to their camping place of the night before. Here they encamped again, and got back to Bemis' (cabin) the next evening. …The next morning all hands started for the Mission, Bemis and Mulliken taking the horses, and Beatty and young Andrew Jackson Hensley the oxen . Beatty and the lad reached the Turkey (river), and found that the mild weather of the day before had made the water too deep to be forded. 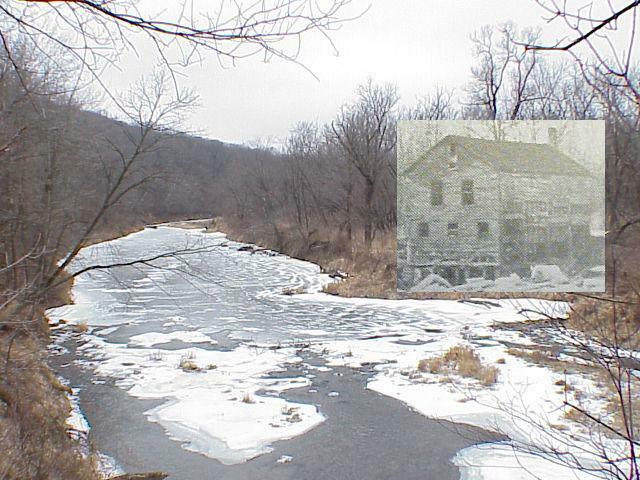 Meantime, Mulliken had crossed the river on a gorge (pile up of broken ice usually jammed up in the riffles by high water) of ice, and started for the Mission, and Bemis had unhitched his horses and started for home, leaving the flour on the bank of the Turkey (in northern Fayette Co). Here Beatty and A.J. Hensley camped that night. The next morning Beatty started A.J. Hensley home with the oxen, and himself stayed with the flour to keep any stray Indians from stealing it. A.J. Hensley (12+years old) trudged along with his six brute companions (he would have had a three team hitch or three yoke of oxen) without trouble until he reached the divided road, one leading to the upper fork and the other crossing the river opposite the Mulliken Bottom. Here his oxen made him a good deal of trouble, for they were determined to go to the upper crossing, which was narrow, and in the high stage of water dangerous. About the time he would get one yoke well started eastward, the others would start southward, and he was pretty well tuckered before he got the procession formed to suit him. He reached the lower crossing just before dark, and found it impassable. Bemis was waiting for him on the right bank, and shouted to him to stay where he was. Accordingly he fastened his bovines (oxen) to the tree about where the emigrant of June 1, 1878, lost their wagons, and stayed all night with an old Indian bearing the pseudonym of "Jim Crow," who lived near by. The next morning Bemis hauled up a big sap through to the ford and ferried the boy over, Mr. Crow" bringing the cattle across. The area north of Mission Road which included all of the Eagles' Point, Westfield, Fayette, Big Rock Valley, was still in the Neutral Ground and not legally open to whites until the late 1840's. However, scouting, squatting, trading, trapping, and other activities were going on from the early 1840's. Indian traders really did not like the settlers in the area as the Indians retreated from them. Good traders were making very nice profits for the day. Trading in furs and skins was still very lucrative. The Mission trail to Fort Atkinson from the settlements in Dubuque, Delaware, and Clayton counties was cut through the timber for freight wagons to pass. It has to be assumed there was an attempt to stay on a relatively well drained grade away from sloughs and steep hills. Probably in many cases using well established animal routes. Even many of the major Indian trails followed animal movement routes, as whether elk, buffalo or man dry, level routes were naturally followed. The exact location of the trail is not known, but roughly stated it entered the southeastern corner of the county about two miles east and one mile south of present Arlington. The trail ran northwesterly to a point a mile and a half south of Fayette, wound around perhaps on the south side of the Volga River, just to the east of Randalia, passing through Donnan, running just east of Hawkeye, and crossing the Little Turkey about four miles north of Hawkeye, running northeasterly to leave Fayette county near the Old Mission Mill. Much of this trail would be used when the Clayton county commissioners sometime around late 1841, made an effort to establish the first road in the county by paying men to make a road as close as possible to where they supposed the south boundary of the Neutral Ground to be for the first settlers to come into the county. In 1840, the Government established a military post north of Fayette County, in Winnesheik, called Fort Atkinson, and three or four miles south established a Mission school for the Winnebago's. This naturally attracted the attention of the pioneers of that day, and in the Spring or early Summer of 1840, Franklin Wilcox, with his wife and little daughter, and his brother Nathaniel, came from Illinois to Fayette County and made a settlement. Franklin Wilcox built a cabin thirty or forty rods north of the north line of Township 92-8, on un-surveyed land, six or eight rods west of a little creek that runs northerly through the southeast quarter of Section 32. This was about 1 ½ miles south and a little west of what would become the village of Westfield/Fayette in the Volga River Valley. About three miles west and three miles north of the Point, half way to Brush Creek (Arlington), an Indian trader, Joseph Hewitt, who had a trading post utilized by both Indians and white men in 1840. His trading post was often a resting-place for early settlers while they ventured out looking for ground to settle on. The ox-trains hauling supplies and produce to the military post at Fort Atkinson stopped at Hewitt’s on a regular basis. Wilcox may have actually spent some time in the area as early as 1835 hunting and trapping, and perhaps "spying out the land" before moving his family and building a cabin. This area was just south of the Neutral Ground and therefore available for "legal" settlement. Wilcox's cabin sheltered other settlers as they moved into the area and erected their own cabins. Shortly a second cabin was erected just to the west. The third cabin in the county was just north of Arlington near Brush Creek. Other cabins apparently went up west of Wilcox's place. A point a couple of miles SW of the NE corner of Smithfield township Hewitt and a man named Culver set up another trading post. Culver soon bought out Hewitt and moved the post to a point about a mile east of Wadena, next to the hill on the N side of the Volga River, as it was nearer the Indians in the Neutral Lands just to the north of Wadena and the Elgin Valley which was always a major settlement for the Indians on the Turkey River. This time frame was probably 1841-1842. About 1840, Nathaniel Wilcox took a claim just west of the big spring in the Grannis Canyon, which at that time was to the north of Bear Grove which included the timber areas of the present day Brush Creek Park, to the north of Arlington. Nathaniel Wilcox had built cabin, in Sec 1, T92, R8, Smithfield Twp, four miles to the east of his brother Franklin Wilcox. This cabin would have been 3mi E and 2mi S of present Main Street Fayette; 2000z. Two single men had put up a cabin on the creek to the south of Franklin's. About a half mile to the east of Wadena in the north bank of the Volga River valley, a banker, Culiver, who had moved to Clayton County from Michigan in 1838, built a trading post, 1841, which was also one of the first buildings in the county and probably the first commercial establishment. Andrew Hensley bought the Nathaniel Wilcox claim in section one of Smithfield township. Unlike many of the early pioneer families who would constantly move to newer frontiers, the Hensley's stayed in the county. On November 27, 1844 after the arrival of his wife from Wisconsin in 1843, the couple gave birth to Daniel P. Hensley, the first white child to be born in Fayette County. Like many of the very early settlers, the Hensley's post office address from 1844 to 1849 was Dubuque, seventy miles away. And for several years Dubuque was his trading point, where he bartered honey for merchandise. The honey was obtained by exploiting the wild bee trees, and one account is of it being obtained by the barrelful. About two miles to the west of Franklin Wilcox's cabin, and about three miles southwest of present Fayette, a couple of men, one with his family, came to the area and set up a trading post near a large spring. This area would be on or near the trail to Fort Atkinson. They apparently began selling whiskey to the Indians. In March of 1843, after a misunderstanding with a Winnebago over a gun and whiskey trade the two white men and two Indians began drinking together. Mrs. Tegarden saw trouble coming and left for the Orrear cabin south of the Wilcox's and about two miles away. She left the children behind as her husband refused to allow them to to along. The story goes that when Tegarden and Atwood had sunk into a drunken sleep the Indians killed them and the tree year old boy. Also hacked with tomahawks were the thirteen year old boy and the eleven year old girl. The Indians left the cabin temporarily to get the horse and sled in order to carry away what they wanted. The girl aroused here brother, and sustaining him by her own strength and courage started to flee for safety. The children, wounded, and weak from loss of blood, poorly clothed, made their way over the prairie in a bitterly cold night through snow over a foot deep, to the Orrear cabin, which they reached at 5am and obtained aid. Meanwhile the Indians returned to rob the cabin and then burn it down with the corpses. The girl lost her toes from frostbite and carried throughout here life a tomahawk mark on her face, so the story goes. About three miles NW of the Brush Creek crossing, a Major Mumford settled on a claim and built a cabin in 1842 (exact timeline has not been verified). 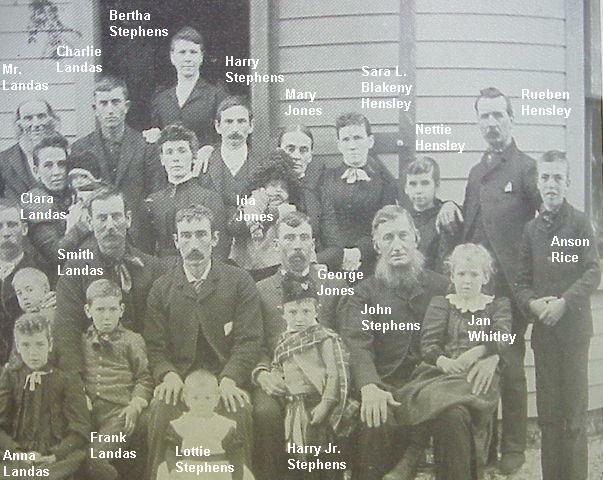 The Mumford’s may have been the parents of the first white child born in the area. Orrear in the fall of 1843 or winter of 1844 purchased Beatty's interest in the their mutual farm. 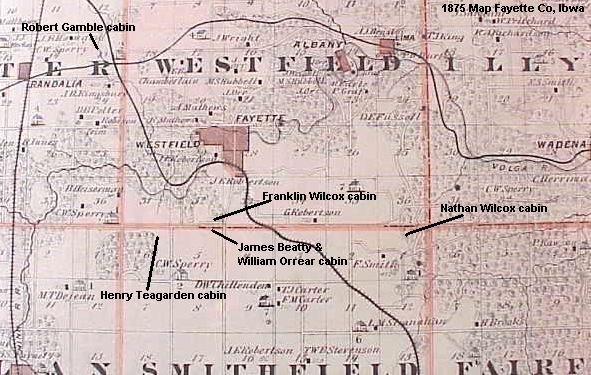 Beatty then moved north and into the Valley of what would be Westfield/Fayette and built a log cabin on the Volga. This would have been on the river near new Hwy 150 bridge, 2000/z, or in Sec 19, T93, R8. In 1844, Isaac Webster had a claim a short distance east of Beatty on the Volga River bottom, which would have been the flats on the east side of present Fayette. Isaac Webster raised a crop of oats, probably the first in the county and stacked them where the UIU campus now is, before thrashing the stacks that winter by tramping them out with oxen. In February of 1844, Orrear married Mary Wilcox, daughter of the elder Franklin Wilcox, who by that time had moved on up the trail to a point near what would be called Dunham’s Grove. This was reported as the first marriage in Fayette County. Mr. Messenger, 1844, settled about 40 rods east of the Teagarden Spring, on the NW 1/4, Sec 6, Twp92, R8 . This would be in the NW corner of Smithfield Twp., just to the south of the Mission Road, 3mi S and 2mi W of present Main Street Fayette. Madison Brown, 1844, built a rude cabin with a roof of basewood bark north of Bear Grove, but within the year sold out to Andrew Hensely and removed to the bank of the Volga, 2mi E/SE of Fayette and "commenced" to the farm. (there is no Volga in this direction, so the description is probably in the Big Rock/Langerman's Ford area 2mi east. The area north of Mission Road which included all of the Eagles' Point, Westfield, Fayette, Big Rock Valley, was still in the Neutral Ground and not legally open to whites until the late 1840's. However, scouting, squatting, trading, trapping, and other activities were going on from the early 1840's. Indian traders really did not like the settlers in the area as the Indians retreated from them. Good traders were making very nice profits for the day. Trading in furs and skins was still very lucrative. Lorenzo Mulliken and Berne's were farming on the south rim of the Fayette Valley (College Hill area), but also trading with the Winnebago's. It was said they conspired with several braves to have Brown driven out of the Big Rock area. Brown reported an occasional bullet whizzing by his ear and one of his oxen was wounded. He had said several Indians killed one of this steers near the Volga, tumbled it over the bank into a canoe and floated down the stream to their camp on the Volga below the Big Rocks. The year was 1845. Brown apparently held on, "in spite of his jealous neighbors," and in 1846 with more settlers coming in, was molested no longer. The first cabin was built north of the future village of Brush Creek in "Bear Woods." By Major Mumford. 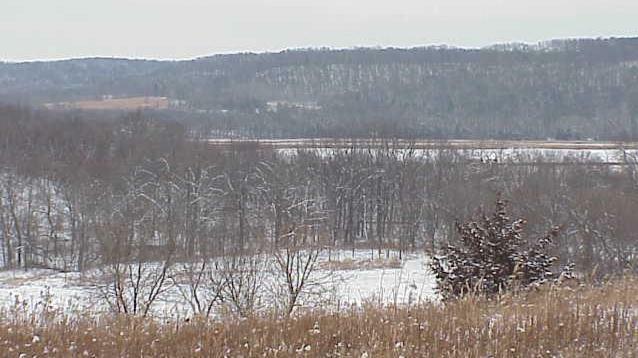 During the winter of 1845, Lorenzo Mulliken lived with Beatty in his cabin on the Volga on the Westfield/Fayette river bottom (just to the west of the present Hwy 150 bridge, 2000/z). A.J. Hensely (age 12+) was there part of the winter helping Webster thresh his oats, which were then hauled to Ft. Atkinson and sold. Orrear who had been farming and running a dairy several miles SW of Fayette along the Mission Road, would sell to Horace Bemis, 1846. Bemis in 1847 would enter (legally register/buy) land the next year, the first entry in Fayette County. Apparently Orrear moved to the Mission until sometime in 1848, when it was reported he removed to Missouri, his wife dying on the journey. The area was seeing more and more movement by early pioneers. Horace Bern's, Jan 17, 1847, entered the NW 1/4, Sec 5, Twp92, R8, which was the first entry (legal claim/buy) of land in Fayette County. This is in the NW corner of Smithfield Twp., 3mi south, 1/1/2mi west of present Main Street Fayette. This is about one mile west of the Wilcox cabin marker and on the south side of the road. The area around Wilcox cabin was the prime location of the first settlers in the area as it was on the Mission Road, just to the south of Neutral Ground. A log schoolhouse was constructed at Taylorsville (2 miles NxNE of Bruch Creek or Arlington). The first school was held in Brush Creek. Beatty who was still living in his cabin on the Fayette Volga flats, apparently was a roving character disliking to remain very long in a place, which was a characteristic of the earliest pioneers that led the way for others to follow. In 1848, he was reported going to Minnesota, where he would go on to become a member of the legislature. Minnesota territory was starting to open up for a similar migration pattern as Fayette County had experienced. Beatty was really of the explorer/trader/trapper type. 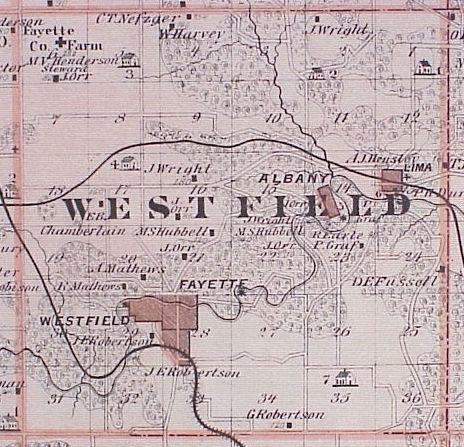 The three other borders of Westfield township were surveyed in 1848. The land was 3/5th tall and wet grass prairie, 2/5th hills covered with a variety of hardwoods. The glaciers had cut across Fayette County diagonally just to the southwest of present day Fayette and Arlington. Thus the prairie to the south and west, and the hills in the north and east. A village was about to be established in the Fayette/Westfield Valley. Robert Alexander in 1848, entered a claim for land just to SE of the present Klock's Island area, and Westfield would be platted in the summer of 1851. Today (2000) this is the area from the new Hwy 150 bridge to the west, and south of the Volga River, all the way to the south side of the park area. It is all of the area over the hill and to the west of Fayette along Water Street or Hwy 93. No original structures survive today, nor do any of the older homes. Westfield is a lost village, like Albany and Lima to the east. In November, 1848, snow fell to the depth of eighteen inches, and remained until April, 1849. It was a cold, hard winter for the settlers of Fayette as well as other sections of the state. In 1848-49, before the surveys were completed, and before the lands were in market, the settlers organized a Claim Society for the purpose of mutual protection against claim jumpers. To the north of the Fayette valley, in the present West Union area, Roger and LyBrand bought 60 acres from Williams Wells, went back to Wisconsin for their families and returned in September, bringing a stock of goods with which they opened up in the Wells' house what could be considered the first store in Fayette county. Meanwhile a celebration was held July 4, 1849, about a hundred yards to the south of the present court house, under some shade trees and near a spring. This was Knob Prairie, and Wells at the celebration got the idea to found a town here. The hill or knob on which the court house now sits, was the prairie on the knob. 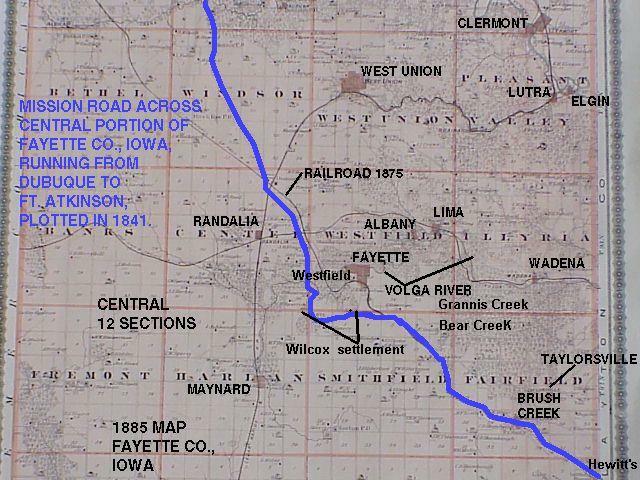 Wells, Rogers and LyBrand lay out a town plat in Sept. of 1849, Wells naming it West Union. The first house was moved into by Rogers on Xmas day. A second building, a store was erected by Daniel Cook by 1850 and a hotel by Cook by 1851. The hotel was immediately sold to a Dr. Stafford, who put in the first drug stock in the county, the first shoe shop and the first sailor shop in West Union. The Conner and Diamond sawmill at Elgin, built in August, 1849, may have been the first mill of any kind in the county. The county had a lot of timber, especially to the northeast, and saw mills would be the first in the area. Saw mills often were flimsy affairs compared to the grist mills. Farms, mills, villages, shops and cottage industries are built. Commerce remains agrarian with transportation by wagon and winter sleds pulled by yoke of oxen or team of draft horses to ports on the Mississippi River or to bigger villages to the south. This was pioneer building and boom time with people coming out of subsistence farming to develop commercial operations where crops and commodities brought in a larger family income. People were settling down to live the rest of their lives in Fayette County and raise their families. Many of the offspring would move on to the west, but others would stay to operate the established farms, crafts and businesses. The coming of the rail to Fayette County in the mid 1870's would bring on the real boom years of commerce and building. The established families would again see an major increase in income and the area would develop into its height of prosperity. The small farming/small business culture of Fayette County lasted into the 1960's when it started to dissipate into the big business culture of the latter part of the 20th century. 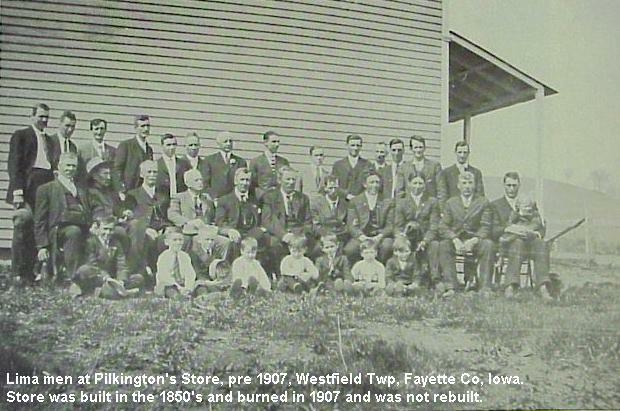 The first Villages in the County---The early platted villages in Fayette county were: West Union-June 1850, Westfield-July 1851, Auburn-1851, Volga City (Lima)-Oct 1851, Taylorsville-Feb 1852, West Auburn-Sept 1853, Centerville (adjoining Taylorsville)-May 1854, Albany-July 1854, Elgin-Feb 1855, Fayette-June1855. ....Lima was one of the first places in Fayette County to be settled. ....Volga city was platted in 1851. The promoters of the plat were Winslow Sterns, Daniel H. Miller and Cornelius Lacy. Before filing of this town plat the locality was known as Lightville. 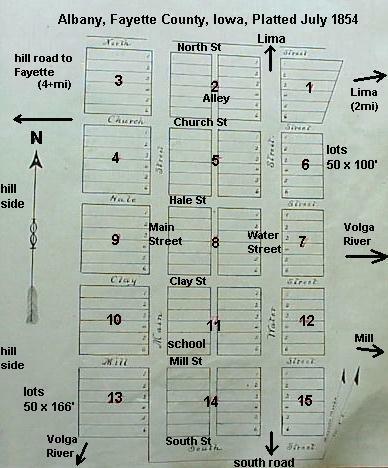 In May, 1851, Lightville came near becoming the county seat of Fayette county. West Union won the elections by a majority of only thirty-five votes in a contest with Lightville, It is now Lima, the name having been changed by an act of the Legislature in 1853. ....Originally the village was called "Lightville," and laid out as "Volga City," with the name changed to Lima by an act of the Iowa legislature. The first settlers to locate in the vicinity (actual grounds of Lima) of present day Lima (1878), were Erastus (Eucharasitic) A. Light and Harvey Light; hence the name Lightville. the Lights built a sawmill on the Volga at this point in 1849-1850, and also a set of burrs for grinding corn. ....Sometime in 1849, E.A. and H.W. Light, T.R. Talbott and Stephen Ludlow came from Wisconsin and and located on the Volga River near where Lima once stood. This early settlement was called Volga City at first, but there was another Post Office a number of miles down the Volga in Clayton County called Volga City, thus the name was changed to Lima by an action of the Iowa Legislature. ....THE LIMA MILL: Talbott and one of the Light's started to build a mill at what was known as Talbott's ford, about a mile downstream from Lima. They had the timbers cut, hewn, and laid out on the bank. About this time a man named Piper, who was or pretended to be a mill wright. Piper apparently became interested in the water power at Lima a mile farther up the stream from Talbott's ford. Piper and Light formed a partnership, unknown to Talbott, and also apparently a conspiracy, as without consulting Talbott, they removed the timbers from Talbott's fort to Lima. Talbott at once commenced an action to protect his interests, with the matter being finally settled by the payment of fifty dollars, and thus the first mill was erected at Lima. ....Stephen Ludlow squatted Volga bottom land S & SE of Lima in the Volga bottoms to the south hill. They would sell their "chance" to Robert Alexander of Westfield (Fayette) for the land (which would be the R.R. Hensley farm). The Ludlow's then bought the mill, but soon after that sold the mill to Clark Newcomb, who placed it in the hands of J.W. Rogers to sell. A.J. Hensley would thus become the owner. Hensley would improve (1852) and run the mill for years to come. ....It is thought the Light's brought the very few goods to Lima when he came in 1849 and thus started the first "store" in Lightville, but the first actual stock of goods was probably put in by Ben Reeves. ....Soon after that, a young man named Hyde, with a little money and some have bad business habits, brought a stock of good to the town and went into partnership with Light. They continued the business for a short time, but were forced to turn the stock over to their creditors, who close the goods out at a forced sale. 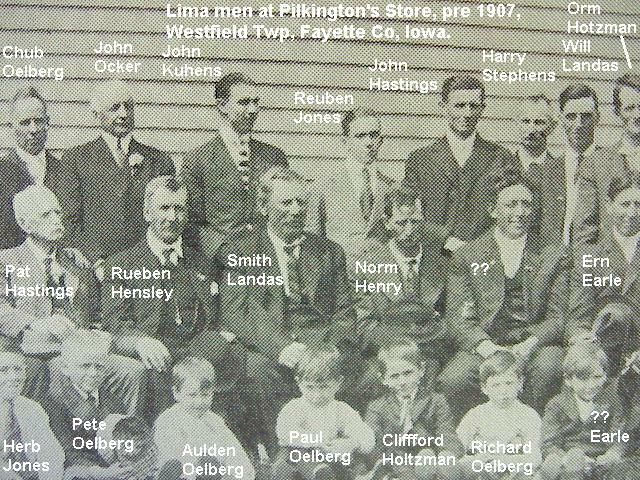 ....Through various changes in proprietorship, there has always been one general store in Lima, with the Olberg family having conducting the mercantile business for a great many years before the early 1900's. ....There was a Post Office next to the Lima Store. And when the railroad was completed a lumber and stock business just to the west of the deport area, which sat a bit south of the Lima Store and Post Office. P.H. Hastings an early pioneer in Illyria township to the east, conducted the stock yards in the early 1900's. ....In the early days of Lima and Fayette County, deer were plentiful. One of the early Lima pioneers reported killing 135 big yellow rattlesnakes in one day. ....Lima was never a really big place. It is said that people who are seeking to find this place often go to the store or the depot, which if not a large structure, and inquire as to the whereabouts of the town, not realizing that they are at that moment in the midst of it. ....At one time Lima had high hopes and great aspirations. In fact, it was one of the contestants for the county seat and came within a few votes of capturing the coveted prize. MILLS in Fayette County---Two three-story mills at East Auburn and West Auburn drew business from as far away as Minnesota. The first flouring mill at Clermont was built in 1849 or 1850, Earl's mill at Auburn in 1851, Elrod's mill at Eldorado in 1851, at Lima in 1852 with the second generation mill in 1865 shown below, at Westfield the Alexander Mill in 1849/50, the Fayette steam mill in 1855, at Wadena in 1858, on Crane creek at Alpha in 1869, at Albany in 1855 then a three-story flour mill at Albany in 1865. Marvin's mill at Albany in 1855 and Marvin's windmill at Fayette about 1865. Gurdy's flouring mill two miles southeast of West Union on Otter creek, the mill at Backbone near Strawberry Point, were built sometime in the early 1850's. There were other mill sites. ABOVE: The Lima mill site can still be found in the 2000's. The picture was taken from the old lima bridge which still stands for now, hidden by trees and brush, blending into the landscape. The mill dam and pond still recognizable about 60 yards upstream to the west. A beaver dam can be seen at the ice line across the river. The mill insert is of the actual Lima second generation mill finished out in about 1865, rebuilt a few times and shown in about 1890 at ice out. The insert shows the mill in about the original location but turned toward the viewer as the end of the mill where the mill wheel shows would have been parallel to the river. The mill dam can be seen at the lower left corner of the picture with the mill race the open water below the picture. The mill pond, that area above the dam, with the bank height showing the 'head' of water retained by the dam. This mill operated until about 1910 when it was closed due to water level issues. The stones were moved a half mile to the right or into the actual Lima village, and used in a small gas powered milling operation for awhile. Andrew Hensley bought this mill site with much of the land surrounding the Lima plat from the Light's in 1851. Andrew and young sons built a first generation basic saw, grist mill and had it operating by 1852. They ran the mill for four seasons and sold it in 1855 to Mr. Durfey who ran the mill for several decades. Andrew kept much of the land to the right of the picture and his son A.J. would farm that land until into the 1900's as well as re-claim the mill site and land in 1878. This mill employed numerous local millers and workers over the years. Much of the lumber for local farms and the few businesses was sawed at the Lima mill, as was the timbers and lumber to the Lima Church which still stands. Above and below: The view is east from standing in the Lima Cemetery. Wadena is 4 miles down this, the Volga River valley. The land at the right and just off the picture was entered by the Light brothers in about 1849. Andrew Hensley would buy it in 1851 and finish the mill and farm the land until 1855, when son A.J. would farm most of the land around Lima and the mill was sold, apparently by contract to Mr. Durfey, as the Hensley family reclaimed the mill in 1878 upon Andrew's death. Mr. Talbott entered the land in the cornfield in the foreground. Talbott and one of the light brothers started the first mill in 1849/50, in the area at 'Talbott's Ford' on the right side of the picture. Below: In 1849, Andrew Hensley bought land in section 19 of Illyria township and moved the family from the Bear Grove cabin. In the picture below, his land in section 19, was straight back of the front of the hill top in the foreground, about a 1/2 mile. He was at this time about a mile and a half from the final Lima Mill site. Above: Moving a bit to the right or south of the first two pictures, Talbott's Ford would be at the break in the treeline on the Volga River's edge and just below the bare hill top on the left of the picture. Talbott and Light never completed the first mill attempt in 1849/50 at this spot, but instead after some 'internal' bickering with other complications, the mill materials were moved upriver about a half mile to the final Lima Mill site location where Light apparently continued to work on the mill. 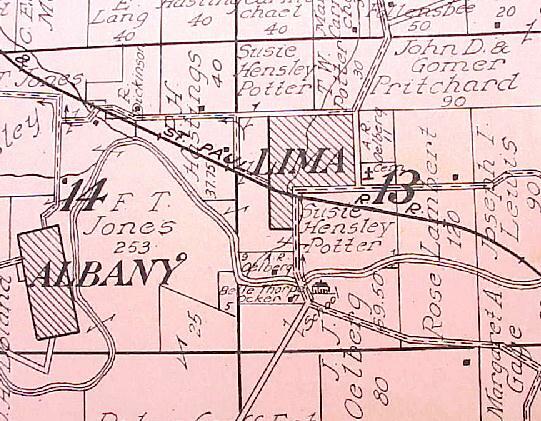 However, in 1851, Andrew Hensley bought the Lima Mill site and the Light farm land and Lima plat land. Andrew finished the mill in 1852, then famed the Lima land and ran the mill until 1855. Above: The white line running under the treeline is the 1970's road. It was not present until that time. The treeline just back of the 'new' road runs along the creek, Lima Brook, that went through Lima, down the Lima bridge and mill area. The village was just off to the right of the picture. The Lima Mill, bridge and school would have been just above the last bit of white road on the left of the picture. The field in view would be owned by the Hensley and relatives from 1852 on, when Andrew purchased the mill site and Lima land from the Light brothers. Note: 4 June 1897, Our mill-dam is completed and now they are sawing and grinding. ....Norm Henry told about the stone burr from the old mill being made from French Flint that came from France as ballast in the holds of sailing ships. The rock ballast was unloaded on the east coast and set aside. The sailing vessels then loaded wheat, and other commodities in the hold for the return trip back to France. ....The discarded stones were brought west to use as mill stones. The stones for the Lima grist mill were chipped out and fitted together without mortar, to make a round shaped mill stone which was about 36 inches in diameter. A steel band was shrunk around them to hold the pieces in place. ....The center burr had a hub made out of steel that supported the shaft coming from the water wheel. In the center of the hub was an adjusting screw to adjust the space between the stone and the stationary stone that lay flat underneath it. The adjusting screw was necessary to grind course or fine grist. ....The grain was fed into the center of the top stone through the hub hole and it spread out between the two stones being crushed and/or ground into a course to fine grist. The grist was then scooped up around the edges of the lower stone to be placed in containers as wooden barrels or grain sacks. ....One of the old stone burr's is at the old Paul Oelberg home in West Union. One is at the entrance to the Lima Cemetery, and donated by Russell Dickenson (who lives in Fayette, 2k). ....The water driven old burrs were later moved north away from the river close to where Rufus Warner's Black Smith Ship was later located, and run by gas engine, as was the saw mill southeast, across the Volga. ....Andrew Hensley built a flouring-mill at this place (Lightville/Lima) in 1852, who not long after (1855) sold the property to P.H. Durfey and Son. The Hensely/Durfey mill structure was 26ft by 40ft, two stories high, and with a stone basement (foundation at water level). The mill was rebuilt in 1865 after flood damage. ....The mill on the Volga River was abandoned in the early 1900's and moved to a building south and east of the store, and powered by a gas engine. A blacksmith shop was just south of the mill, run by Ed Wing, son Flin, and brother John. Later John Schroek sold the blacksmith shop to Rufus Warner, who's son Raymond converted into a garage when cars became numerous. Raymond Warner sold out to Leonard Anfinson in 1943, who sold to Aaron Loucks in 1965. Then it was sold and taken over by the Volga River Project. The history of the Fayette County communities as a permanent settlement, like that of most local histories, begins not with a town but with farmers and farming, and perhaps a mill, (and the merchants/tradesman that follow and support the farming endeavor). What kind of farming is generally left to the imagination. In the old 1850 census report Mr. Price listed eight Fayette county farmers and statistics relating to their land, machinery, live stock, crops, etc. What Eight Farmers Owned and Produced, 1850 census---These eight farmers owned property as follows: 1569 (average of 196 acres each) acres of land, of which 585 (average of 73 acres each,) acres were improved (improved land was land that had been cleared of timber and brush, was either capable of being plowed or utilized for grass pasturing), and all valued at $9080 (1135 each,). Farm implements and machinery valued at $864 (108 each). Live stock valued at $2205 (275 each), consisting of 18 horses ( about two each), no asses or mules, 19 milch cows (about two each), 25 working oxen (three each), 32 cattle (4 each), 60 sheep (12 each), and 190 swine (14 each, pigs were often allowed to run in the open lots and timber and easy to raise as 'wild hogs'). Total Production---These eight farmers in total, during 1849, produced crops estimated as: wheat-485 bu, rye-0 bu, Indian corn-5000 bu, oats-484bu, tobacco-300bu, wool-198lb, peas and beans-8bu, potatoes-222bu, buckwheat-115bu, butter-1510lb, hay-183tons, grass seed-2bu, maple sugar-1950lbs, molasses-39gal, beeswax and honey-1238, home manufactures valued at $48, slaughtered animals-$241. The eight 1849 Fayette County Farmers showing in Mr. Price's 1850 Census---They were the farming ancestors that "led all the rest." Jerod Tailor (or Taylor) Farm (three miles northeast of Arlington,z)---On March 31, 1849, Taylor entered (claimed) 120 acres of land in Fairfield township, 40 being in Section 14, 40 in Section 15, and 40 in Section 23,92-7 (This land is exactly two mile north and one mile east of present Arlington, or one mile north of the Talyorsville Cemetery, z). Seventy if his acres were listed as improved land (capable of cultivation or pasturing,z), machinery-$100, 1 horse, 2 milch cows, 2 working oxen, 5 other cattle, 6 sheep, 22 swine, total value of livestock-$219. Produced: 60bu wheat, 200bu oats, 25lbs wool, 1bu peas and beans, 15bu potatoes, 100lbs butter, 30 tons hay, 2 bu grass seed, 1200lbs maple sugar, 30gals molasses, 50lbs beeswax and honey, slaughtered animals-$15. Tailor's name was not on the 1855 Fayette County tax record (apparently he had moved on, which was often the case with pioneer families, settle for a few years and move west hoping for better conditions,z). Chaunsey Brooks Farm (three miles south of Fayette,z)---60 acres of improved land, farm machinery-$50, 3 horses, 3 milch cows, 5 other cattle, 8 sheep, 25 swine, livestock value of $266. Produced: 80bu wheat, 200bu corn, 50 bu oats, 100lbs butter, 15ton hay, 50lbs maple sugar, 60lbs beeswax and honey, $50 in slaughtered animals. On May 24, Chauncey Brooks entered 160 acres of land in Section 12-92-8, now Smithfield township (This farm would have been 2 1/2 miles south of Grandview Cemetery at Fayette or 1 1/2 miles north of the Maynard corner, along the west side of present Hwy. 150 on the creek that is visible from the highway,z). That neighborhood is still called (in 1940) by old timers, The Brooks neighborhood. Solon Barnes Farm (five miles southeast of Fayette in the Korn Hill area)---35 acres of improved land, $5 machinery, 1 milch cow, two working oxen-$40. Produced: 300bu corn, 30bu oats, 200lbs tobacco, 50lbs butter, 4 tons hay, 310lbs beeswax and honey, $10 animals slaughtered. Barnes was not found among entrymen prior to 1850. In 1855 tax record indicated assessed on 80 acres in Sec. 1-97-7, now Fairfield township (This farm was five miles southeast of Fayette on the actual Korn Hill area, or five miles northwest of Arlington. Korn Hill itself about 3 1/2 miles east of Fayette and one mile south off the present blacktop road called Korn Hill Road,z). William Wells Farm (the northern part of present West Union)---200acres of improved land, machinery $400, 4 horses, 4 milch cows, 13 working oxen, 3 other cattle, 30 sheep, 25 swine, total value $697. Farm products: 200bu corn, 70lbs wool, 14bu potatoes, 60bu buckwheat, 500lbs, butter, 70tons hay, 300lbs maple sugar, 5gal molasses, 818lbs beeswax and hone, slaughtered animals $35. William Wells on December 5, 1849, entered 160 acres of land in Section 17-94-8, now Union township. William Wells started the town of West Union. Remembrance Lippencott Farm (on the northeastern outskirts of present West Union)---40 acres improved land, $75 farm machinery, 2 horses, 1 cow, 10 swine, value $177. Farm products: 40bu wheat, 700bu corn, 15bu oats, 100lbs tobacco, 56lbs wool, 3bu peas and beans, 13bu potatoes, 55bu buckwheat, 300lbs butter, 7 tons hay, value of home manufactures $18, animals slaughtered $50. I do not find any original entry of land by Lippencott prior to 1850. In 1855 he was taxed on 280 acres in Sections 9, 10, 15 of township 94-8, now Union Township, are the three section around the northeastern outskirts of present West Union). Why Were Only Eight Farmers Listed in the 1850 Census of Price?--- Why Barns, Fetch, Whitely, and Lippencott appear on this list of farm operators and do not appear yet to have entered any government land; and why data is given for none of the other 146 households found in the summer of 1850 by Mr. Price., in which homes all but a few of the men were listed as farmers, is something some to wonder about.. Comments About the Eight Farmers---For the eight farmers for whom the 1850 census gave property and products data these facts appear: Tailor let in oats, maple sugar, molasses and diversity in stock and products. Cash value his farm $1000. C. Brooks though high in cattle did not lead in any one respect. Value farm $1000. Solon Barnes let in wheat and tobacco. Value farm $180. J. Brooks let in cattle (except working oxen). Value farm $800. Fetch let in potatoes. Value farm $300. Whitely let in horses. Value farm $2500. Wells led in total live stock, wool, hay, beeswax and honey. Value farm $3000. Lippencott probably made the best showing of diversified farming for improved acres. Value of farm $1300. Most of the residents enumerated in 1850 probably had come too late to raise a crop in 1849, (and that is why they did not show on the farm census). Some of the older residents were probably "settlers" on government land which they expected to acquire but for which they had not yet secured a legal title. Robert Alexander began the erection of a saw-mill on the Volga River (at Westfield) in 1850 (remember he took up land here in mid-1849) in the area that sits on the southeast side of what is now Klock's Island Park, on the southeast corner of the park, just as the south fork of the Turkey River (Volga) just as the river leaves the edge of the bluff in the Westfield Valley, thus the starting of the first settlement in the valley at the site which would become the little settlement of Westfield and lasted for several years until the area around the main street of present Fayette began to grow more rapidly in the late 1850's. A few years into the future the area of Alexander's sawmill would be on the bank of a mill race which would supply the Westfield woolen mill which would be to a short distance to the north of the dry run bridge which sits just to the east of the present (2000) Klock's Island entrance. This dry run is actually the lower part of the old mill race where the water was constricted down and gained speed just before it ran across the wheel of the Westfield woolen mill. Robert Alexander would claim and buy up several thousand acres along the Volga River flowage in the townships around Westfield and become a major land speculator in the process becoming very wealthy for the times and area. His son-in-law, James Robertson would own much of the land in the 'to be' Fayette valley. Erastus Light (and his brother) built a sawmill, 1850, at Lightville (to be Lima). A log school house was erected in Brush Creek, and also used for regular church services. Between 1840 and 1850 there were people who lived in Fayette county, for a while at least, whose names did not appear in the census list recently printed in the column for 1858. Most of those folks had moved away by 1850. PETERMAN'S FIRST PIONEER LIST OF THE 1840'S--- ? Atwood, ? Baker, W.H. Bailey, James Beatty, Horace Bemis, ? Bonham, Samuel Barazelton, Benjamin Brooks, Henry Brooks, Hiram Brooks, Jessie Brooks, Nelson Brooks, (their father) Brooks, ? Chlson, Samuel Connor, George Cook, James (Jimmie) Crawford, Sam Crane, George Culver, Amos Cummings, Goodson Cummings, Lewis Delzene, Joseph Dickinson, ? Downs, Lorenzo Dutton, Robert Gamble, John Giles, Charles Glidden, ? Hadley, Andrew Hensley, Joe Hewitt, Moses Hewitt, ? Hyde, Charles Jones, Henry Jones, E.A. Light, ? Lucklow, Hyler Lyons, ? Messenger, ? Mullign, Major ? Mumford, John Nagle, Earl Newton, Royce Oatman, William Orrear, Jacob Ourey, John Paddleford, William Paddleford, Willima Palmer, Reuben Perkins, Zopher Perkins, ?2 Pettit, ? Piper, John Randall, ? Rausdell, Ben Reeves, David Ring, William Ring, J. W. Rogers, William M. Rosier, ? Ryan, ? Sackett, Moses C. Sperry and father, ? Spofford, James Stevenson, T.R. Talbot, ? Teagardner, ? Tombs, William Van Dorn, Kitten Voshell, Isaac Webster, Franklin Wilcox, Nathan Wilcox, Sanford Wilcox. NOTE: Many of these surnames keep showing up in county history and in the cemeteries. Total for Earliest Familes--- The Peterman list, and the 1850 census list contain a total of about 290 names as possible heads of first families in Fayette County. There are about 215 different family names (surnames) found in the two lists. 13 tradesman; 5 millers sawing lumber, 4 millers working grist or floor mills, a cooper, wheelwright, carpenter, and brickmaker. As stated earlier farmers led the settling of an area, but millers had to follow immediately, with a few craftsman as listed plus blacksmiths, harness makers. Less essential craftsman would not be far behind, thus the pioneer industry which supported the local farming operations developed and continued for decades until big agribusiness eclipsed the lifestyle. The first recorded deed (plat) in the county was on July 24, 1850, on a town lot in West Union. 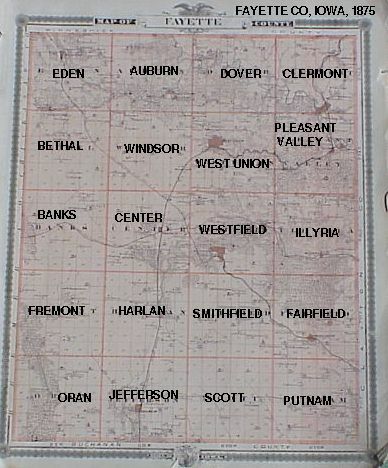 The early platted villages in Fayette county were: West Union-June 1850, Westfield-July 1851, Auburn-1851, Volga City (Lima)-Oct 1851, Taylorville-Feb 1852, West Auburn-Sept 1853, Centerville (adjoining Taylorville)-May 1854, Albany-July 1854, Elgin-Feb 1855, Fayette-June1855. Between September 26 and October 9, 1850, Eliphalet Price, living in Clayton county, made a census enumeration for Fayette County, which had that year been set off from Clayton County. He probably traveled on horseback to reach the one hundred fifty four families or houses which he found and listed for this entire county in 1850. The Census of 1850 is Stimulating to the Imagination---As one studies the old fashioned handwriting of Mr. Price, and scans the names of the several hundred men, women and children he listed, it is easy to let the imagination go and try to take in fancy that trip with the enumerator over the unbroken hills and prairies and through the original forests of Fayette County---the prairies with their tall waving native grass and flowers, and the forests with only an occasional log cabin sheltering some pioneer family. Heads, or other Representative of Families Found Listed in Fayette County, Iowa, Census of 1850---The census taker started in the southeast corner of the county and worked back and forth toward the north. Thus the number by each name indicate the approximate location in the county from south to north, with the lower numbers being in the south part of the county. Likewise, consecutively or close numbers were from the same "neighborhood." When a number is in parenthesis another person has been listed as apparent head of the house. Where one family name applies to two or more persons only the name of the apparent husband, or of the oldest of the named group is given. Robert Alexander 31 (Note, he was operating on a sawmill on the southern portion of Westfield in the Fayette valley, therefore numbers close to him are in the Fayette area, bz/1999) , Noah Alexander 34, William Anderson 9, Horace Andrus (?) 48, Wilcox Aquilla (?) 64, Peter Alsern (38), James Austin 147, Solon W. Barnes 6, (Note, Solon Barnes is farming just north of Taylorsville, so anyone near the 6 number is in the area of Brush Creek/Arlington or Centerville/Taylorsville, z)Henry H. Baker 15, William Bartlett 141, Charles Bell (96), Margaret Berk 61, Solomon Bishop 63, Joseph Bradshaw 11, Harvey S. Bronson 124, Chansey Brooks 5, David Brooks 5, John Brooks 25, Mattison Brown 52, Oliver Brown 126, Martin Burdick 151, Harrison Butler 32, Absolom Butler 128, Caleb D. Carlton 117, James Carrol 84, Washington L. Case, 107, William P. Cavenaugh 62, Lukins Clark (?) (129), Chester Clestern (?) 105, Margaret Connor (76), John Conner85, Matthew Connor 90, Samuel Connor (90), Joseph Crawford 129, Thomas Crooks (49), Thomas Crooks 49, Franklin Crosley 20, James Davis 154, Joseph Deford 78, Lewis Deloynie 152, Benjamine Dimond 87, Thomas Douglas (38), John Downey (114), David H. Downs 142, Morris Earl 137, Hiram Earl (137) (Note: the Earls were millers and with these high numbers were probably located on the Turker River above the Elgin area, Earl's would run the big Albany Mill in the 1860's, z) , James Earl 138, John Eddy 137, Rudolphus Eddy 144, Charles Ellis (129), Dempsey Elrod 64, Ely Elrod 129, Sarah Elrod (129), Isaac Enders 143, Knud Everson 82, Ambier Everson (92), William Fetch 67, Daniel I. Finney 9, Isaac Fitch 60, Thomas Follett 51, Elipholet Follett 112, Simon Follett (112), Edwin Follett (117), Rebecca Forbes (87), Simeon B. Forbes 88, Joseph Forbes 89, Joseph Foster 140, Robert Freeman 19, William Frasier 76, John Frasier 82, William Fussell 28, David E. Fussell 30, Oliver P. Gallaher 55, Ephrom Gardner (151), James Garrison (55), Helen Gear (47), David German 8, William Gibblin 53, Levi Gifford (136), Calvin Gitchell 150, Stephen Greenup 125, Nathaniel Hall (119), John Hannah (38), Elisha Hartsoff 132, Samuel Hatton 56, John Hendershott 108, Michal Henmon 42, Andrew Hensley 45, Abraham Holing 149, Jacob Hoover 131, Henry Hopkins 40, Lysander Hopkins (137), Elizabeth Hopkins (137), Lyman Hord 127, Oley Houson 94, Bent Houson (94), Sarah Huff (114), James Hughson 148, Sarah Hunt (15), Charles Hyler 95, Lemuel Iliff 118, Benjamine Iliff 122, Hiram Jackson 103, James Jennings 29, John Johnson (106), Henry Johnson 106, Jason Johnson 111, Elf Johnson (111), Anson Kellogue (3), John Kellogue (31), Thomas Kerr 119, John Kerr (119), Hannah Kirkpatrick 129, Chaunsey Leveritt 110, Jacob Librand 68, Crotus A. Light 46, Harry W. Light 43, Remembrance Lippencott 72, Hugh Lockard 7, Gabriel Long 102, Monroe Lott (87), Robert K. Lounsburg (13), David Lowe 18, Stephen H. Ludlow 47, William Lumsden 50, Alexander Lumsden (50), Clark Lukins (129), Joseph Lyon 104, Ermina Lyon (104), Dorcus McCameram (80), Daniel McDuffy 145, Joseph McGee 36, Thomas McKinley (26), William McKinney (13), George McKinney 14, Joseph McLaughlin 57, Andrew Martin 116, John Matthew 117, John Matthews 108, America Mattews (99), Avril Miller 23, George Miller (43), Wilson Miller 66, Eugene Moine 22, John P. Moine (22), Evleine Morkley (2), William Morris 49, George Morrison 123, Russell Moron (147), Alexander Mussleman 120, George W. Neff 33, Palmer Newton 21, William E. Newton (21), Jerod Nutting 100, Eren Oleyson (93), Jacob Orey 74, Mary Ottercreek (87), Betsey Ottercreek (90), Sirenius Packard 99, Francis Palmer 97, Albert Palmer (97), Asa G. Park 4, Woodman Perkins (1), Calvin Perkins 12, John Philips 105, Ebenezer Piper (137), Alonzo Randel 54, Stephen Reeve (88), Samuel Rice 73, Richard Richardson 26, Phroney A. Rickell 71, Jacob W. Rogers 65, Jacob Rosier 133, George Rosier (133), William Root 77, Ely Root 79, Emily Root 81, George Rowley 106, Nickolas Russell 58, Charles Sawyer 113, Allen Sawyer 114, James L. Sawyer 115, Thomas Scott 41, Sylvester Seward 3, Conwright Sheeley (31), Chansey S. Smith (23), Thomas J. Smith 39, Henry F. Smith 71, George Smith 83, David Smith 136, Charles Smith 139, Asa South 129, George Stansbury 75, James B. Stephenson 86, Samuel Stevens 98, Susan Stobough (57), Philip Stobough 59, Thomas B. Sturgis 38, David Tailor 1, Silas Tailor 10, Willima Thompson (69), Anthony Thompson 96, John Turner 130, Francis Vosial 16, Peter Vosial 17, Marrion Warner (117), Edwin C. Watters (or Wotters) 153, Levy W. Watrous 44, Lucy Welch (4), William Wells 68, Matthew Wells 69, Sarah Wells 69, David Wells 70 (Note, Wells is in the Knob Prairie/West Union area, z), Joshua Wells 80, George L. Whitley 24, Arson Wickham 146, Aquilla Wilcox (64), James Wilson 137, Thomas Wilson (146), Joseph Woddel 39, Thomas Woodel 37, Benjamine Woods 27, Jimerin Woodson 13. …In 1842, Andrew Hensley came from Wisconsin to Fayette County (probably in the extreme SW corner of Grant Co, just across from Dubuque, Iowa, 60-70 miles from Fayette, and the start of the Mission Trail into Fayette County and to Fort Atkinson) , and purchased the claim of Nathaniel Wilcox on or near Sec 1, Smithfield Twp. about five miles to the east of the ‘Wilcox Settlement,’ which was the first recorded cabin in Fayette Co, build by Nathaniel’s brother Franklin. The Wilcox Settlement was a ‘gathering’ point for the very few first settlers in the area on the Mission Trail or neutral grounds line. …Andrew had come to Fayette County alone. He traveled back to (SW Grant County) Wisconsin, intending to return to his new Iowa home the same fall in 1842, but sickness prevented his return. …In September of 1843, Andrew returned as far as Ead’s Grove in northern Delaware County (Manchester), with his family, consisting of a wife and four children, among whom was Andrew Jackson Hensley, then a lad of ten years. The family spent the winter of 1843/1844 in Ead’s Grove. …In the Spring of 1844, Andrew rented Joe Hewett’s place, just northwest of Strawberry Point, just in the edge of Clayton County. Andrew at the same time, moved his family into a little cabin about 1 ½ miles west of Hewett’s, in the edge of Fayette County. A cabin owned by Moses Hewitt, son of Joe Hewitt by his first wife. It was in this cabin just across the Fayette County line that on November 27, 1944, Daniel P. Hensley was born, credited as the first white child born in Fayette County. …Andrew Hensley settled in April of 1844, in Sec 1 of Smithfield Township, Fayette Co, Iowa, near a woods called Bear Grove on the edge of rolling hills known as Korn Hill. He was one of the very first white settlers into Fayette County. …Mr. Hensley purchased his groceries (supplies) for several years at Dubuque about 70 tough ox wagon miles away, on the Mississippi River. He often exchanged honey for commodities. Being one of the first white settlers into the region, experienced frontiersmen had early success in the exploitation of numerous honey trees. …Prior to 1849, his post office of use was at Dubuque. The first convenient post office for Andrew Hensley was at Yankee Settlement (Colesburg), about 25 miles down the old Mission Trail. …In the winter of 1846-1847, the children of Andrew Hensley were sent to Ead’ s Grove (Manchester) to school. To visit their parents, in the lonely wilderness of along the Mission Trail east of Wilcox Settlement, they once or twice made their way on foot, through the snow in sight of Indian camps, and past Joe Hewitt’s trading post just inside the Clayton Co. line. …Andrew Jackson Hensley reports that when a lad of about 15 he often visited the Mission in 1845 (The old Mission village and school just below the northern border of Fayette Co, that served the Indians around Ft. Atkinson, just to the north. Today this is the village of St. Lucas.) He stated that the Indians would send their papooses to school only when they were short of provisions, that when their larders were well supplied with the fruits of the chase, they would neither work nor go to school. The school and fort were abandoned in June of 1848, when the Indians were pushed out, but from 1840 until 1849 or so, Fort Atkinson and the Mission School were important points and furnished a market for the few settlers in Clayton, Delaware, Dubuque, and the area of Fayette Co just below or south of the Mission Trail. …On April 21, 1847, Fayette Co, became an attachment to Hewett Township in Clayton Co. The first election in August of 1847, elected Andrew Hensley and M.C. Sperry as Justices of the Peace. …On October 13, 1849, Andrew Hensley entered section 19, in Illyria Twp, Fayette Co, Iowa. This is the along the Volga River just to the east of the "to be" village of Lima, and on the line between Westfield and Illyria Twp. This is one of the early entries of land in Fayette County above the neutral ground line. It is at this time all of the frontier settlers just to the south of the Mission Trial "jump" across to claim prime new farm locations along the Volga River Valley. All of these early area settlers had been living near the Mission Trail, including the settlers in the Lima area, along with the Light brothers. …At an October 8, 1850 meeting of Fayette Co. judges of election for Westfield Twp, east, were Michael Hinman, Stephen H. Ludlow and Andrew Hensley. …Andrew Hensley, Kentucky; age 68; moved to Edgar County, Illinois on the Indiana line ExSE of Springfield, with his fathers family in 1822; to Grant Co., Wis., east of Dubuque, Iowa, in September, 1839; to Fayette County and made his claim in 1842 on which he settled in 1844; farmer; married Susan Lewis in 1823; she died in 1837; married Sarah Lovell in 1839. …Andrew Jackson Hensley, son of Andrew; born in Missouri (Apparently on an island in the Mississippi River below St. Louis, as reported in census data. At time the Mississippi River bottoms in the area were a 10-15 mile expanse of prime, natural wetland interspersed with a multitude of small waterways and sloughs. It is likely Andrew was involved with farming and/or making a living gathering natural products on the biologically rich Mississippi bottoms lands of the time, thus the statement in the census records of A.J. being born on an "island' below St. Louis. bz/2003), age 38, came to Fayette County in 1844, married in 1858 to Loretta Smith who was born in Winnebago Co., Ill; age 30, who moved to this county in the Spring of 1846. 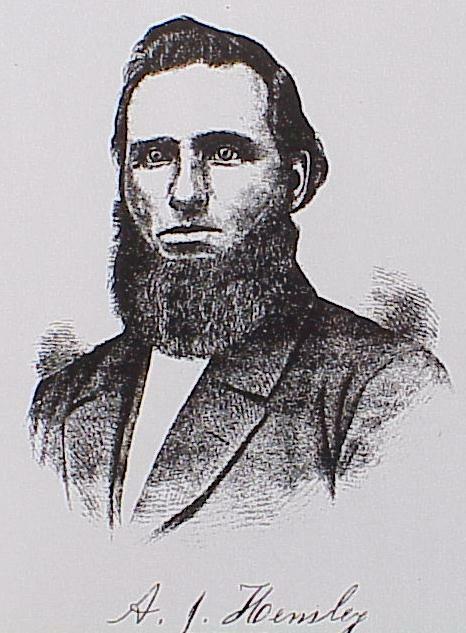 Andrew Jackson Hensley, son of Andrew Hensley, a 'first' pioneer into Westfield Township. 'Jack' Hensley was a very well known family head and citizen around Volga River Valley towns of Lima, Albany, Fayette and Wadena area. A.J. came to Fayette County when a boy of ten with his father Andrew Hensley and grew up with nearly all of the first pioneers along the Mission Trail. Grandfather of Andrew Hensley, Fayette County, Iowa, pioneer. 2 William James Hensley b: 1775 in Virginia Note 1: 1810 Census, Floyd Co, KY Note 2: 1822 Emigrated to Edgar Co, Illinois Note 3: 1790 In Tazewell Co, VA.
--- 3 Andrew Hensley b: November 18, 1803 in Floyd County, Kentucky d: January 08, 1878 in Lima, Sec 13, Westfield Twp, Fayette Co, Iowa Burial: Lima Cemetery, Sec 13, Westfield Twp, Fayette Co, Iowa Note 1: 1822 Moved to Edgar Co, Illinois, east edge, ExSE of Springfield. Note 2: September 1839 Moved to Grant Co, Wisconsin, east of Dubuque, Iowa. --- 3 Aaron Hensley b: 1806 in Logan Co, VA Note 1: 1830 Census, Clark Co, Illinois. Note 2: 1840 Census, Kanawha Co, WV. The Hensley family plot is located at the right, front of the cemetery. View is to the ExSE down the Volga River valley toward Wadena, 4+ miles away. Stones from left to right are Nettie Hensley Breckon (dau of Rueben), Sarah Jane Blakesly Hensely (wife of Reuben), Reuben L., headstone, Sarah Lovell Hensely (wife of Andrew), Richard N. (son of Andrew, killed at Vicksburg), Andrew (family patriarch). 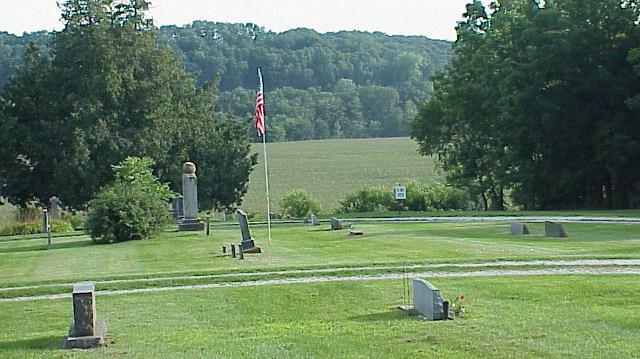 View looking south across the front of the Lima Cemetery. The main Hensley plot it under the cedar tree behind the tall marker to the left of the flag pole. The village of Lima was off to the right a couple of hundred yards. The field in view was part of the original land Andrew took up when he came to Lima in about 1851 and finished off the mill site. The Volga River is in the tree line across the field. The mill site is off the picture to the right side a hundred yards. Andrew moved from this farm in 1855 to the Albany farm, but he retained the the fields nearly all around the village of Lima. His son A.J. would farm those fields, as well as the farm about 2 miles up Frog Hollow north of his father's farm at Albany. The Hensley farms in both the Lima and Albany locations would remain within the family structure until well into the 1900's. Nearly all of that land was 'confiscated' by the conservation commission in the 1960's to become part of their 'Volga River project,' thus most of the local history has been erased or is now hidden by the removal of nearly all hints of the early farms and villages and the natural succession of grasses, shrubs and trees. Hensley Sarah J. July 14 1852 October 14 1914 62 3 67 Wife of R.L. Jones Ida (Hensley). 1873 1966 93 3 Wife of Frank T.
the Fayette County, Iowa pioneer. Son of William James as listed in the tree just above. Please Note:The genealogy data below has been donated and collected form internet sources, with disagreement of dates, names, spelling, places, etc. Please be very aware that any of the data can be inaccurate. I have made numerous assumptions at to birth and burial locations upon the location of residence. The births and burials in Fayette County, in general are probably fairly close due to using cemetery information and also due to personally knowing locations of movement of the family. I would be pleased to add more Hensley related information in any form to this page, plus I will edit any errors. - 2 William James Hensley b: 1775 in Virginia Note 1: 1810 Census, Floyd Co, KY Note 2: 1822 Emigrated to Edgar Co, Illinois Note 3: 1790 In Tazewell Co, VA.
----- 3 Andrew Hensley b: November 18, 1803 in Floyd County, Kentucky d: January 08, 1878 in Lima, Sec 13, Westfield Twp, Fayette Co, Iowa Burial: Lima Cemetery, Sec 13, Westfield Twp, Fayette Co, Iowa Note 1: 1822 Moved to Edgar Co, Illinois, east edge, ExSE of Springfield. Note 2: September 1839 Moved to Grant Co, Wisconsin, east of Dubuque, Iowa. -------- 4 Andrew Jackson Hensley b: December 03, 1833 in Mississippi River Island, below St. Louis, MO d: September 26, 1925 in Fayette, Westfield Twp, Fayette Co, Iowa Burial: Fayette, Grandview Cem, Sec C, Lot 315, Westfield Twp, Fayette Co, Iowa Occupation: Farmer, Sec 13, Lima, Westfield Twp. Note 1: Bet. 1866 - 1877 Postmaster, Lima, Westfield Twp, Fayette Co, Iowa Religion: United Brethan Church Occupation: Farmer, Sec 13, Lima, Westfield Twp. -------- 4 Reuben L. Hensley b: July 01, 1841 in Coles Co, Illinois d: August 03, 1929 in Albany, Sec 14, Westfield Twp, Fayette Co, Iowa Burial: Lima Cemetery, sec 3, lot 67, Sec 13, Westfield Twp, Fayette Co, Iowa Occupation: Farmer, Sec 14, near Albany, Westfield Twp, Fayette Co, Iowa. Occupation: Farmer, Sec 14, near Albany, Westfield Twp, Fayette Co, Iowa. ----------- +Mary Stevens m: April 11, 1916 in Lima Community Church, Lima, Sec 13, Westfield Twp, Fayette Co, Iowa Note 1: Mrs; widowed. -------- 4 Daniel P. Hensley b: November 27, 1844 in Hewitt cabin, east edge of FairfieldTwp, Fayette Co, Iowa d: May 16, 1926 in Lima, Sec 13, Westfield Twp, Fayette Co, Iowa Burial: Lima Cemetery, sec 3, lot 67, Sec 13, Westfield Twp, Fayette Co, Iowa Note 1: November 27, 1844 Claimed the first white child born in Fayette Co, Iowa. Note 2: Was his second wife Hattie Durfey?? Note 3: 1880 Census, laborer in Fairfield Twp, Fayette Co, IA. Military service: 1862 Civil War, Co. G 38th Iowa Inf. enl. Aug 15, 1862, disc Aug 6, 1863, disabled. --------------- +Mable Burns m: January 01, 1900 in Wadena, Illyria Township, Fayette Co, Iowa. --------------- +Noble Heinrich Wilhelm Seedorf b: October 10, 1883 in Aurora, Fayette Co, Iowa d: December 17, 1970 Burial: Taylorsville Cem, Fairfield Twp, Fayette Co, Iowa m: June 10, 1903 in Oelwein, Jefferson Twp, Fayette Co, Iowa. -------- 4 Cordelia S. Hensley b: November 01, 1853 in Lima, Sec 13, Westfield Twp, Fayette Co, Iowa d: November 15, 1926 in Lima, Sec 13, Westfield Twp, Fayette Co, Iowa Burial: Lima Cemetery, sec 3, Sec 13, Westfield Twp, Fayette Co, Iowa Note 2: 1878 Living near Volga River, 3mi SW of Fayette. ----------- +Albert Hulbert b: May 12, 1850 in Oswego Co, NY d: 1926 in Lima, Sec 13, Westfield Twp, Fayette Co, Iowa Burial: Lima Cemetery, Sec 13, Westfield Twp, Fayette Co, Iowa m: February 22, 1873 in Lima, Westfield Twp, Fayette Co, Iowa Occupation: 1878 Farmer, Sec 35, Center Twp, P.O. Fayette. Note 2: 1857 Came to Fayette Co. Religion: United Brethan Church Occupation: 1878 Farmer, Sec 35, Center Twp, P.O. Fayette. ----------- +Joseph Luewellyn Adams m: July 04, 1873 in Brush Creek (Arlington), Fairfield Twp, Fayette Co, Iowa. ----- 3 Aaron Hensley b: 1806 in Logan Co, VA Note 1: 1830 Census, Clark Co, Illinois. Note 2: 1840 Census, Kanawha Co, WV. ....In 1852 Andrew Hensley acquire the Nathaniel Wilcox claim in section 1 of Smithfield located near the red circle at the west end of Bear Grove near Bear Creek. Andrew returned to Grant County, Wisconsin east of Dubuque, Iowa, for the family. He became sick and over-wintered in Wisconsin. Later in 1853 the removed the family through Dubuque, traveled the Mission Trail to Eads Grove (Manchester) where he over-wintered. .....In 1844 Andrew moved the family permanently into Fayette County and bought a second claim and rudimentary cabin from Madison Brown, probably on Grannis creek in section 36 of Westfield. In the late summer or fall of 1844 he hired Mr. Noble from Yankee Settlement (Colesburg) to break open (plow) a small field of prairie grass probably in the whitish area on the above map, around the red circle in section 1, Smithfield. Remember, it generally took multiple yoke of oxen and a big heavy single share plow to break any kind of prairie soil. The bottom land field near bear creek would have been tall grass prairie with in this case grasses with medium deep roots Andrew and his young sons hand sowed winter wheat in this field. Winter wheat germinates in the fall, lies dormant under the snow, then grows rapidly to maturity in the late spring and is harvested by early summer. The climate in northern Iowa was much harsher and colder than the Hensley's had been accustomed to while growing up in Floyd County, Kentucky and Edgar County, Illinois. However, the Hensley's harvested the reported first crop of wheat in Fayette County from this field. ....The winter of 1844-45, the Hensley family spent in the basic cabin bought from Madison Brown, apparently at the head of Grannis Hollow. Mrs. Hensley would have a run in with some Indian braves at this cabin during 1845 and become 'scared' to return to the area. Andrew would move the family into one side of the old Franklin Wilcox cabin at Wilcox settlement for the warm seasons of 1845, while Andrew built his own cabin, apparently at the Bear Grove claim. .....The Hensley family would live in the Bear Grove cabin from the winter of 1845 to spring of 1849 when Andrew would purchase land in section 19 of Illyria Township. This was about a mile and a half downstream from where the Light brothers were attempting to build a mill at what became known as Lightville, later to be named Lima. 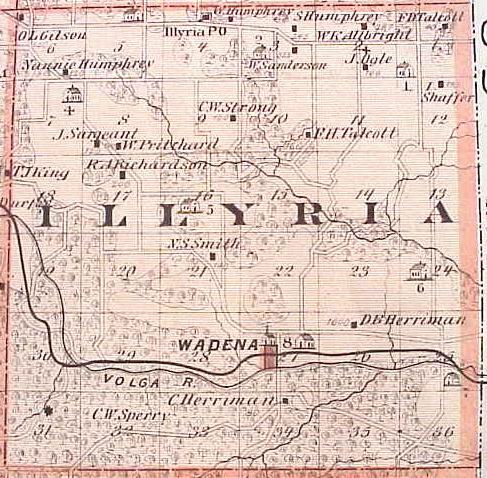 The family would stay on the section 19 land in Illyria Township from 1849 until 1851, when Andrew would acquire the Lima mill site from the Lights and much of the land immediately adjacent to the village plat and within the platted town. The Light brothers would move on at this time leaving Andrew in 'charge' of the area. 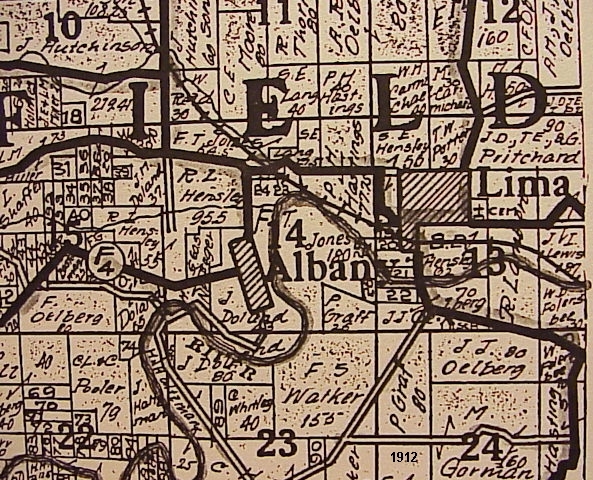 While Andrew is living in section 19, a mill was started by one of the Light brothers and Talbott at Talbott's ford across the Volga about at the red line on the map. That mill was never finished and the timbers and materials moved upriver to the location where the Lima mill would be started by one of the Lights and a Piper. They never finished, Andrew Hensley bought the property of the lights including the mill site. .....By 1852 Andrew had finished a first generation saw and grist mill at the Lima location and have it operating while finishing living quarters at Lima and moving the family up from section 19. The children were getting older and now becoming a significant part of the family work force. Andrew would operate the Lima mill until 1855 when he sold it to Mr. Durfey, who would oversee the mill for several decades, along with other millers and workers. Andrew retained most of the land surrounding and within Lima. .....After selling the Lima mill, Andrew would buy the bottom land farm immediately adjacent to the northern end of the Lima plat and running up into the wooded hills to the west of the bottoms. Andrew would farm this land with the help of his children until his death in 1878. His son-in-law Reuben Perkins would then run the farm for a number of years before removing 8 miles SE to the Brush Creek (Arlington) area. Andrew's son Reuben L. Hensley would take over the farm and even acquire more of the hills land to the west. Reuben L. Hensley farm here until his death in 1929. .....After Andrew moved to Lima farm, his son A.J. farmed the land around Lima, plus a farm 1+ miles up Frog Hollow to the north of Andrew's Albany farm. After 1878 the mill property apparently reverted from the Durfey's back to the Hensley family and A.J. kept ownership of the mill for sometime but Mr. Durfey continued to run the mill. Eventually A.J. would move into Fayette and the Lima land would revert to his sister Susie Hensley Potter, to include all the land the circumvented the village of Lima and much of the platted village land. In 1855 Andrew sold the mill site, his son A.J. 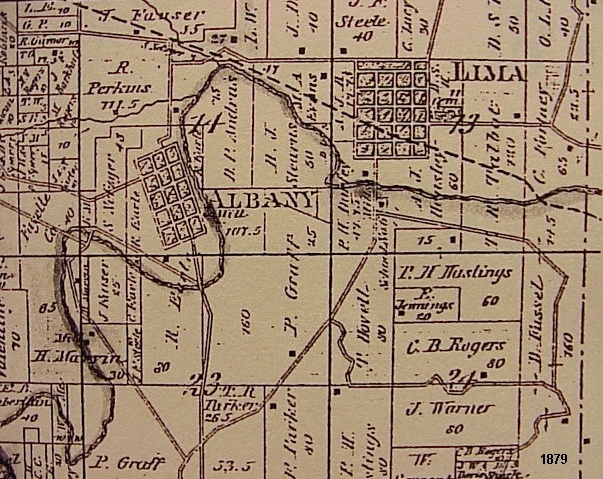 kept much of the Lima land, while Andrew acquired the farm at Albany with would lie off to the immediate left or north of the Albany hill. The hill in the background overlooks Lima, A.J. 's farm and the mill site. Looking off the left/NE from the top of the Albany hill the timber in the foreground was the westward part of some of Andrew's farm. This area would also be owned as woodlots by area families, but in later years the Hensley's would acquire most of the adjacent hills area. Frog Hollow goes up the creek bottom land to the left of the pictures. Swinging the view from the top of the Albany hill a bit back to the east and toward Lima which is on the right of the picture below the hill in the background, one can see the major field area of Andrew's farm covered with snow. The view is across Andrew's field from the bottom of the Albany hill at the northern edge of the Albany plat looking up Frog Hollow. Andrew's farm is the land north of Church street running from the right side of the picture into the hills off the left side of the picture. 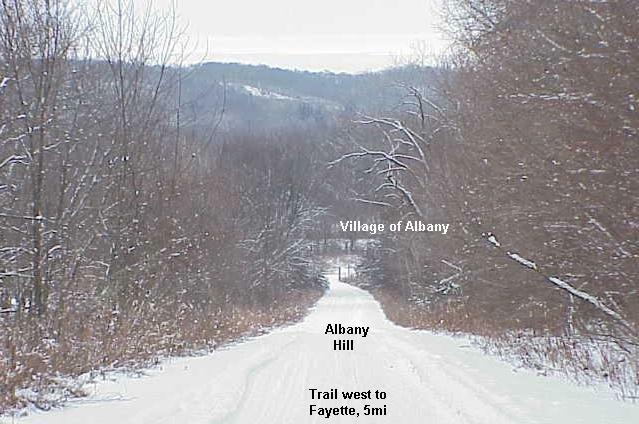 Albany village has been gone since the 1960's to be replaced by a horse campgrounds operated by the conservation commission. There were actually quite a number of houses in this village up to the 1950's. The line of trees on the left was the location of a row of houses as well as well as along the interior blocks and water street, plus south on the road to the bridge. The population was never very large, perhaps 120-150, but actually larger than the Lima population. Since these villages were one-plus miles apart they shared interests and services. They were very unique in remaining basically very small stable pioneer farming types of villages insolated from major development through their 'hundred years' from 1850-1950. Lima and Albany area plat maps. Hensley and other pioneer lands can be tracked. An area divided into many small land ownerships indicated a wooded area usually in a hilly region. farmed the Albany farm until his death. All of these Lima, Albany area folks are related by marriage. The Hensley tree above lists some of them under Reuben's line. …Reuben Hensley, pioneer settler goes to his final reward. Resident of Fayette County, Iowa, since 1844, passed away August 3, 1929. Reuben was born in (Edgar Co) Illinois, July 1, 1841, the son of Andrew Hensley, a native of Kentucky. There were 4 girls and 3 boys in the Andrew Hensley family, besides three boys from a former marriage, Isaac L., Andrew Jackson and Jacob Goodwin. Reuben was the last of the family alive. Andrew Jackson, Daniel P. and Cordelia having died within the last four years (1925-1929). …When Reuben was a very small child (early 1840’s) the family moved into Wisconsin (Grant County, east of Dubuque, Iowa) from Kentucky (from the Cole/Edgar County, Illinois area on the eastern border with Indiana, ExSE of Springfield.). In 1843 (spring of 1944) the Andrew Hensley family came to eastern Iowa, which was then an Indian territory. They lived the first winter (1843-1844) at Eads Grove (Manchester). …In the spring of 1844 they came to Fayette County and lived at Bear Grove (probably on a second claim and in the cabin built by Madison Brown on Grannis Creek a mile north of Bear Creek. 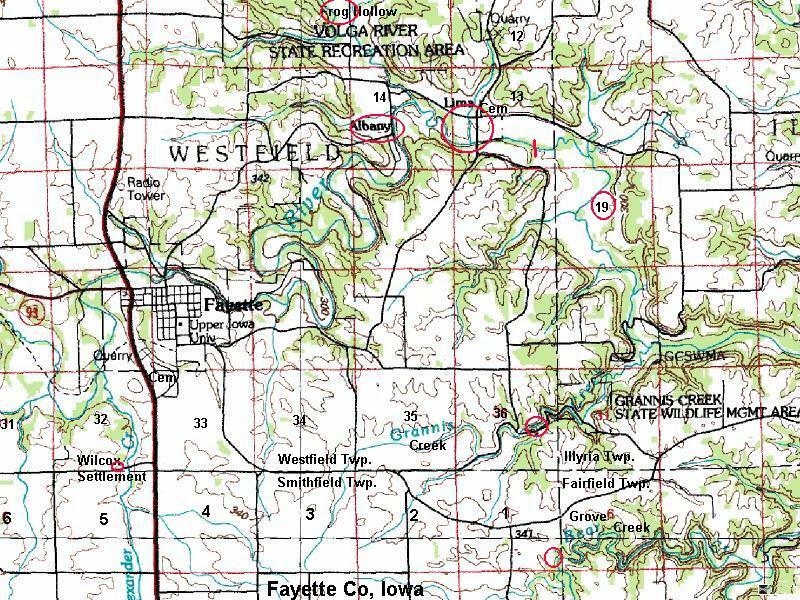 ), which was on the line between Smithfield and Fairfield townships, not far northwest of Arlington (At that time this was only a very few cabins along the Mission road from Dubuque up through Fayette County to Ft. Atkinson across the county line in Winneshiek County. A cabin was settled by a family named Moe so the ‘settlement’ was becoming known as Moetown, soon be called Brush Creek with the name changed to Arlington in 1895). …In 1855, when Reuben was 14 years old they moved to the farm near Albany (on the north edge) where the children all grew to manhood and womanhood, and as the years went by were scattered away. …Richard and Daniel went to the Civil War. Daniel alone came back, as Richard sleeps on the battlefield. 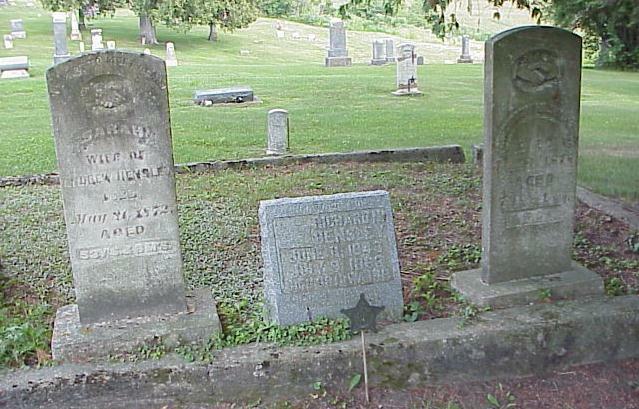 Elizabeth is buried in Decorah, Winneshiek Co, Iowa. Caroline in the West, Sarah near Arlington, and Cordelia at Lima. …From this home near Albany the father and mother passed to the Great Beyond many years ago. Not to long ago Cordelia came back there to die, and today we carry the body of Reuben to its last resting place. Last Saturday at nine in the evening God spoke to him to lay his burdens down and come home. …Reuben Hensley was married to Sarah Blakeney (spelling??) of Auburn, Auburn Twp, Fayette Co, Iowa, January 1, 1871. Two little girls gladden their home, Ida and Nettie. Reuben and family lived in Albany a few years and in 1881 he purchased the old home and moved their April 11 of that year. Nettie and her mother went home many years ago. Ida is Mrs. Frank Jones of this vicinity. …April 11, 1916, Reuben Hensley was married to Mrs. Mary Stevens, who survives him. This date, April 11, was the anniversary of his first moving back to the old home farm. …Mr. Hensley was formerly of the Baptist church at Albany. He contributed to the building of the church at Lima, and united with the Methodist Episcopal class there and continued faithful to the end. …Reuben was a hard working man, of an unassuming nature, always preferring to suffer wrong than to do wrong. He was always patient, thoughtful, and of a contented disposition which is well expressed in these lines of the poet: "I would not have the restless will that hurries to and fro; Seeking for some great thing to do or secret thing to know. I ask Three for daily strength. None who ask are denied; And a mind to blend with outward life. Still keeping at Thy side. There are briars besetting every path, That call for patient care; There is a cross in every lot, and a constant need for prayer; Yet a lowly heart that leans on Thee Is happy everywhere." …Besides a host of friends and many distant relatives he leaves to mourn his loss, his wife, daughter, Ida, and husband, and two grandsons in whom he took much pride. Rueben and Hebert. Reuben is at home on the farm and Herbert spent the past year in Ames (Iowa State University). …A very large concourse was in attendance upon the funeral services, conducted by Rev. D.M. Parker at the Lima Church, Monday afternoon, with the burial in the cemetery nearby (Lima Cemetery). …Reuben L. Hensley and the Finch Brothers are making preparations to build new houses this fall. …We understand a new time table is soon to go into effect on our railroad and that the freight and passenger will meet here at 10:45 am. …The one great event this week was the moving of the post office. P.M. Hastings had moved into the new store, has everything new and convenient and handles the mail with the grace and ease of the old hand. F. T. Pilkington is duly installed as assistant and will look after Uncle Sam’s interest in the absence of the postmaster. …Mr. E. E. Henry lost a valuable horse last Monday. …Lima is gaining quite a reputation as a butter and egg market, the highest price in the county being paid. Let it boom; it needs it. …Mrs. Bass and family will remove to West Union this week. We are sorry to see them go. …W. F. Shepard and family have returned from California and will settle here at Lima, concluding this is the El Dorado. …Mrs. C. Wilson is quite sick and requires the attendance of a doctor daily. …Rumor says our boys will get into trouble if they do not quit playing ball on the Sabbath. 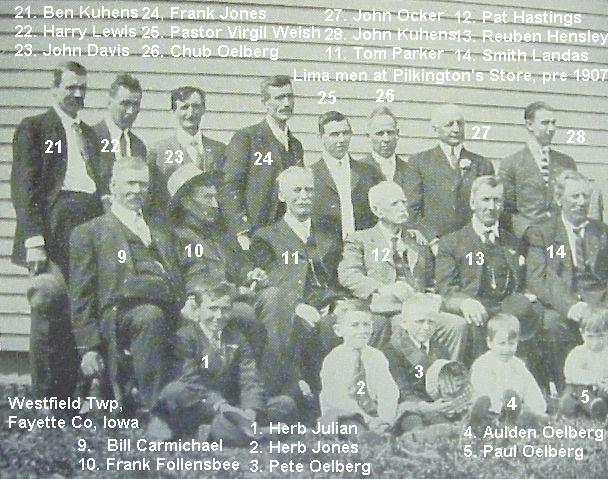 A hint to the wise, &c.
Offrspring in their later years of several original pioneer families of the Lima, Albany area. HENSLEY, ANDREW J., farmer, Sec. 13; P. O. Lima; born in Missouri Dec. 3, 1837; came to this county with his father in 1843; his father (Andrew) who died Jan. 3, 1878, was the oldest settler in Fayette Co. The son was married Nov. 25, 1858, to Loretta Smith; she was born in Winnebago, Co., III., Aug. 10, 1841; have two children ---George W., born Sept. 18, 1859, and Susie E. (would marry a Potter and take over the Hensley farm adjacent to Lima), Oct. 6, 1863. He (A.J.) was Postmaster here (Lima) from 1866 to1877, Township Trustee and School Director several years. He can remember when the country was full of Indians; his brother, Daniel now living in Fairfield Township, is claimed to be the first white child born in what is now Fayette Co. Family belonging to the United Brethren Church. Hensley, R, (Reuben, younger brother of A.J.) farmer (on his father's farm just north of Albany), Sec. 14; P. O. West Albany. USE STATEMENT: All scenery graphics, layout, and context throughout IowaZ web pages are the copyright of the Webmaster unless otherwise credited for other than personal or educational institution use is prohibited. Pictures were taken with a Sony Mavica FD91.